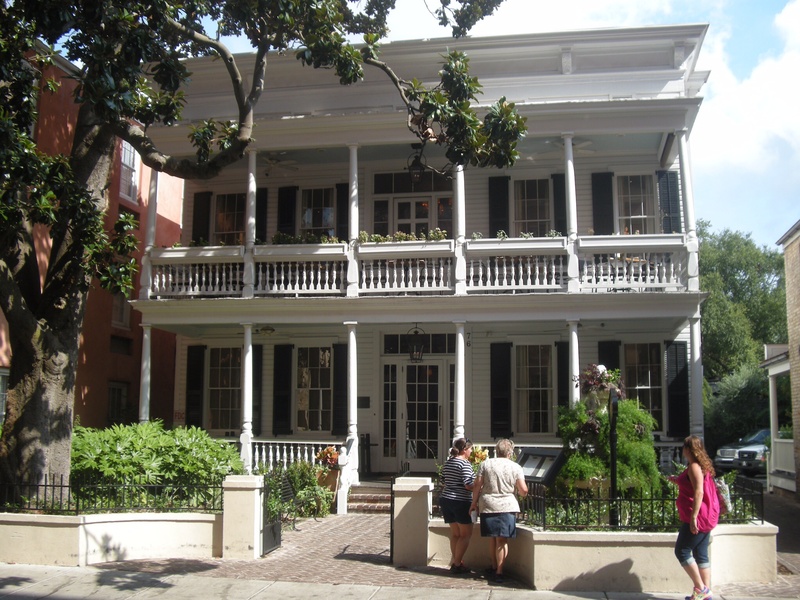 The good life in the Lowcountry (or how Charleston saved my American adventure). I had just about resigned my taste buds to overly sweet or very salty food and my American journey to rainy weather, the sound of motorbikes screaming to be put out of their misery and the vision of a never-ending highway when I loaded up the car and programmed the GPS for ‘get me the hell out of here’. Now, I know I didn’t see Myrtle Beach at its best, well, weather-wise anyway, but in a journey that had, up to that point, been full of wonder and awe, Myrtle Beach sucked all the joy out of my American road trip. Goodbye to a very grey Myrtle Beach. With the rain still falling, I left the motel at 7am. An hour later, the clouds began to clear and I could just make out the blue South Carolinian sky that I had been promised. The landscape changed from grey seashore to green pines and live oaks lining the roadside and when I stopped to get breakfast there was an aroma of sea salt mixed with pine and sage. The clouds disappeared as I continued my journey south and, with all the highway signs and the GPS pointing the way to Charleston, suddenly life wasn’t so bad after all. 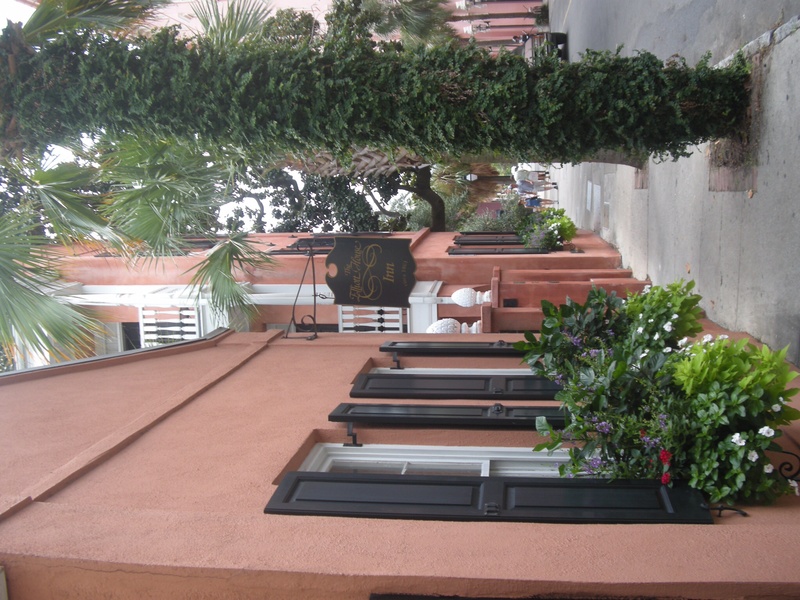 Charleston was to be the highlight of my trip – promises of southern charm, a rich historical legacy, great food and really nice accommodation fueled my journey at this point and, boy, I wasn’t disappointed. All I can say is thank goodness for Charleston. 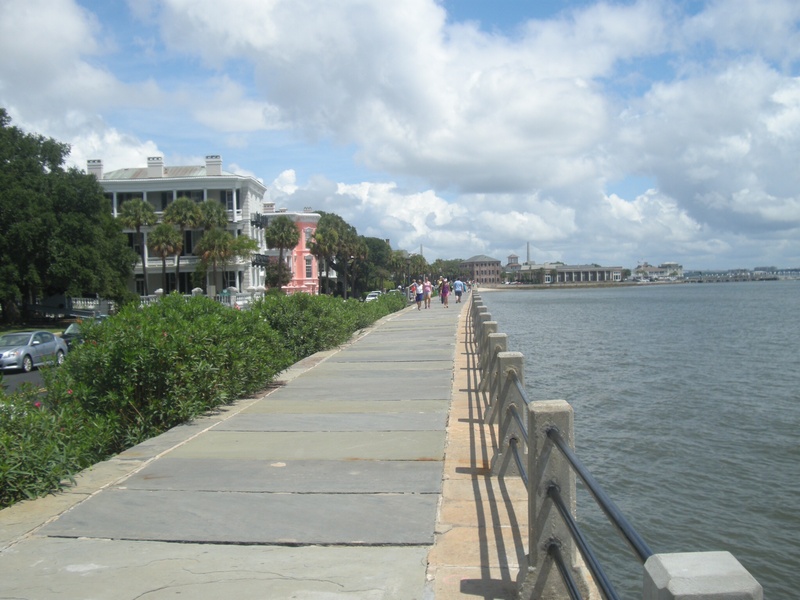 From the moment I arrived, taking the Arthur Ravenel Jr. Bridge across the Cooper River on to the peninsula and arriving at The Elliot House Inn, I could tell that this is a very special city. 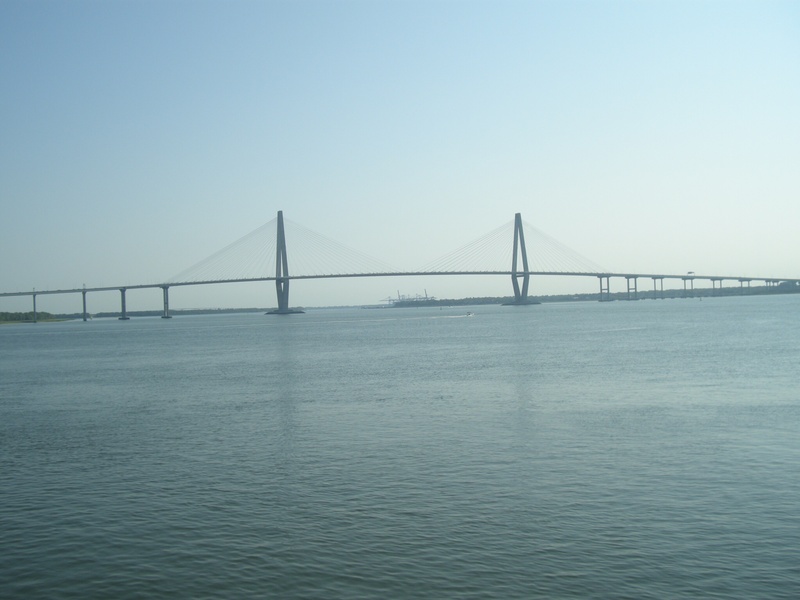 Arthur Ravenel Jr. Bridge, gateway to Charleston. Tucked away, within walking distance of the ‘Battery’ which is at the tip of the peninsula, Elliott House is perfectly positioned for those who like to explore the city on foot. At the Battery, I paused looking out on Charleston Bay where the Ashley and Cooper rivers meet before they join and head off out into the Atlantic. And there, still standing like a sentry in the bay, I got my first sight of just one of the main reasons that my journey to Charleston was so important. 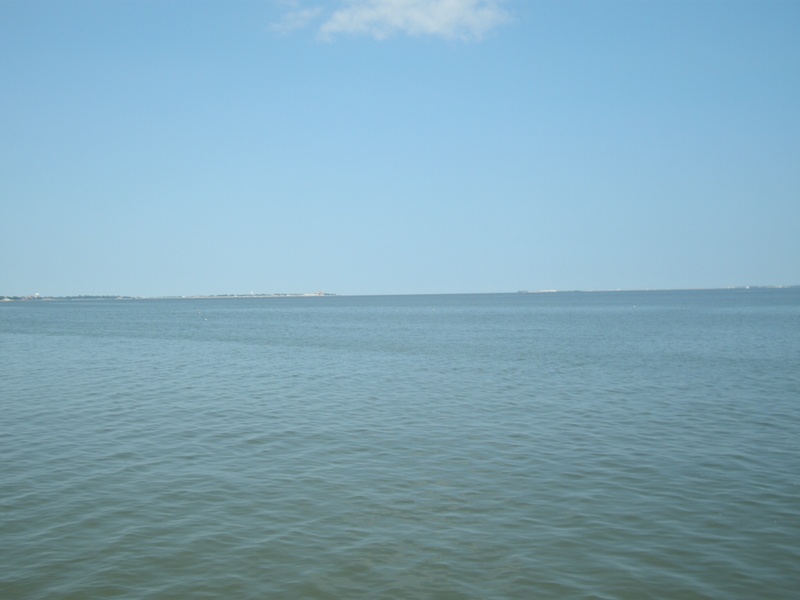 On the horizon, about three miles from where I stood, was Fort Sumter. This is where the first shots were fired and the Civil War began. 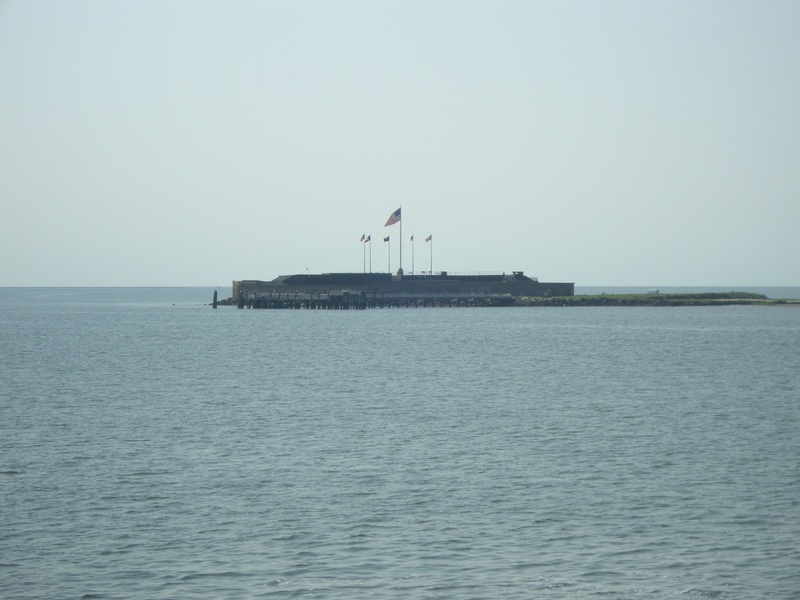 This fort in the middle of the bay saw the first acts that tore a country apart. Some 600,000 deaths later and the Union flag was raised once more in Charleston Bay. Fort Sumter would have to wait until the morning. Right now, as the warm breeze made me feel alive again, I needed to sample some of that southern cuisine I’d heard so much about. The city is packed with restaurants but the good people at Elliott House had recommended a very special eatery just a couple of doors down the road from the inn. Husk was voted one of the best new restaurants in the USA when it first opened a few years ago and it was there that I hoped to redeem my faith in American cuisine. Husk – where dreams of good food come true. At Husk they have a simple policy: ‘If it doesn’t come from the South, it’s not coming through the door’. James Beard Award-Winning Chef Sean Brock’s menu changes almost everyday and that was just what I was looking for. I naively ambled up the steps, through the doors and asked to make a reservation for one for dinner later that evening. Time for the Irish brogue and a bit of charm, I thought. ‘Oh, that is disappointing,’ I said. ‘I’ve come all this way and had heard such good things about Husk. Is there any way I could eat here before I leave?’ I asked. ‘Well, let me see,’ the southern belle said, looking through her reservations book. As I headed off out into the Charleston evening, I knew that at least I could sit at the very impressive bar in Husk tomorrow evening, soak up the atmosphere and enjoy one or two Mint Juleps, perhaps. Then, I just went next door to another restaurant, Poogan’s Porch, where I got my first taste of good southern cuisine: a fried oyster salad and some southern fried chicken with all the fixins. And it proved to be an excellent introduction to fine food in the Holy City. Oh, in case you think I’ve gone mad – to a lot of people back home the Holy City is somewhere else entirely – Charleston is known (locally anyway) as the Holy City because of its many churches; there seems to be one conveniently located on almost every street. 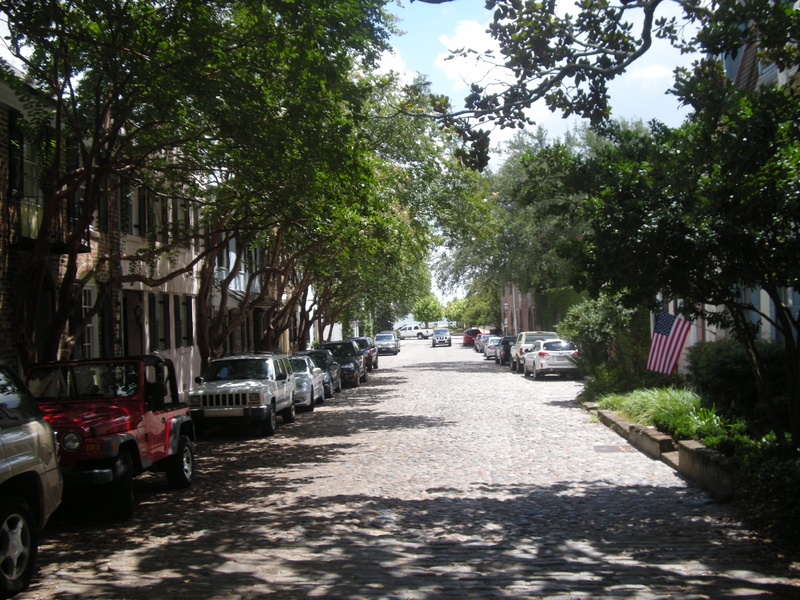 One of the beautiful cobblestone streets in Charleston. 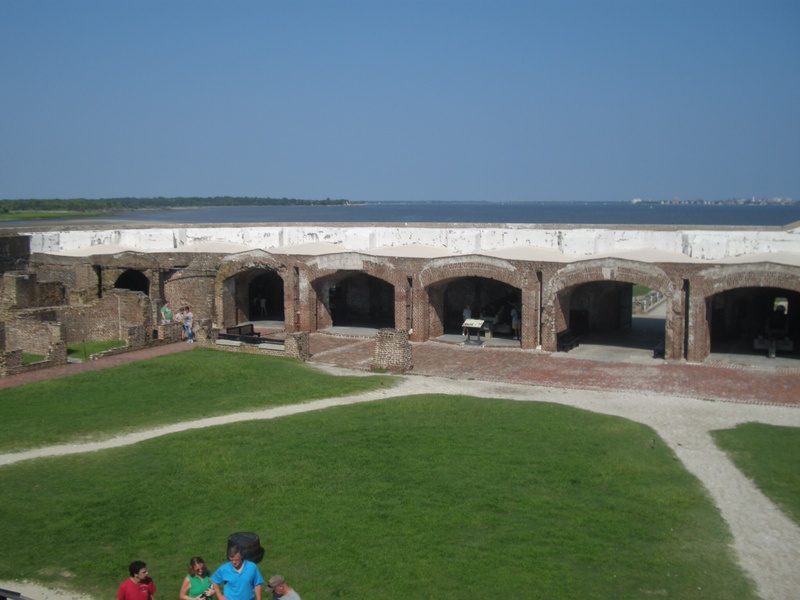 The next morning, my mission was to see Fort Sumter. I made my way to the quayside where I would take the boat out to the little rocky island in the bay. On the trip out to the fort, I got my first view of the city from the water. Back on the peninsula, the narrow tree-lined streets have survived wars, floods and earthquakes. Charleston was once the richest city in the US and it retains that antebellum charm that I imagined made it a real southern city. 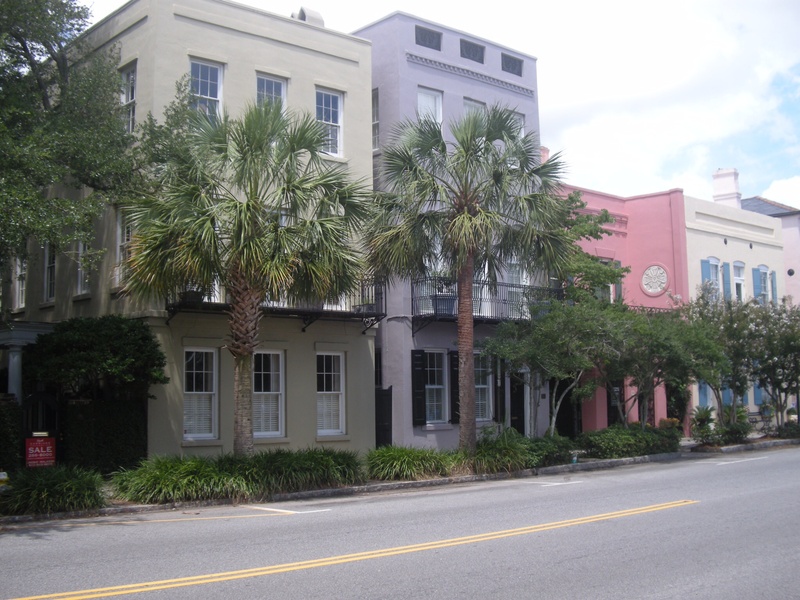 From the water, looking back towards the city, you see the beautiful houses that line the quayside along the Battery and the docks that once exported the bountiful produce from the great plantations of South Carolina: cotton, indigo and rice or ‘Carolina Gold’ as it was called. The plantations along the Ashley and Cooper rivers, with their thousands of slaves, fed the merchants of Charleston who in turn sent these goods to Northern factories and mills or across the Atlantic to the textile mills of England and France. This is another legacy of the city, a city that grew rich on the labour of thousands of enslaved people. This history is still evident today with echoes of the past everywhere to be seen: the big houses, the ornate gardens and parks, and the slave market, all standing as a reminder of a Charleston from a different time and a different world. 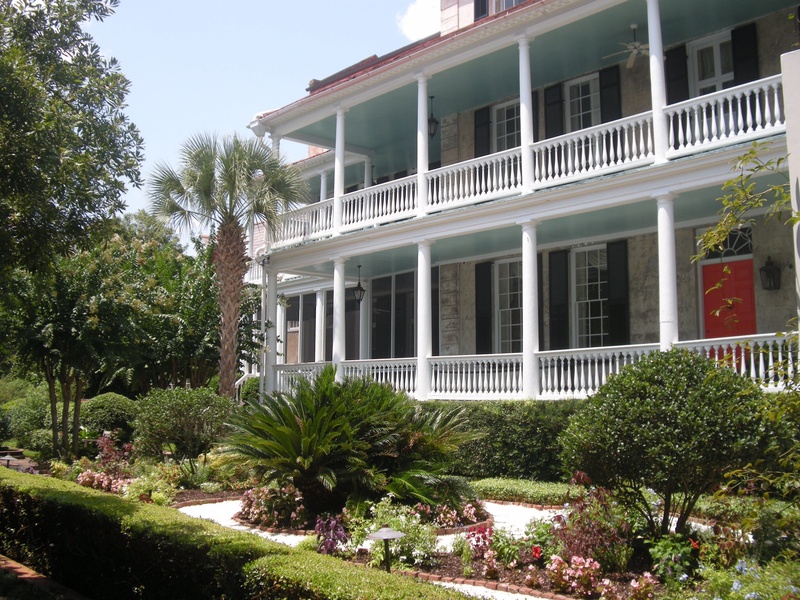 The houses of Charleston have a very distinctive style and the gardens are just beautiful. As I made my way out to Fort Sumter, I began to imagine the scene when the first shot was fired on that April morning back in 1861. That morning, over 150 years ago, on the Battery where I stood yesterday, there would have been hundreds of people cheering as the shot and shell smashed into the walls of the fort three miles away. 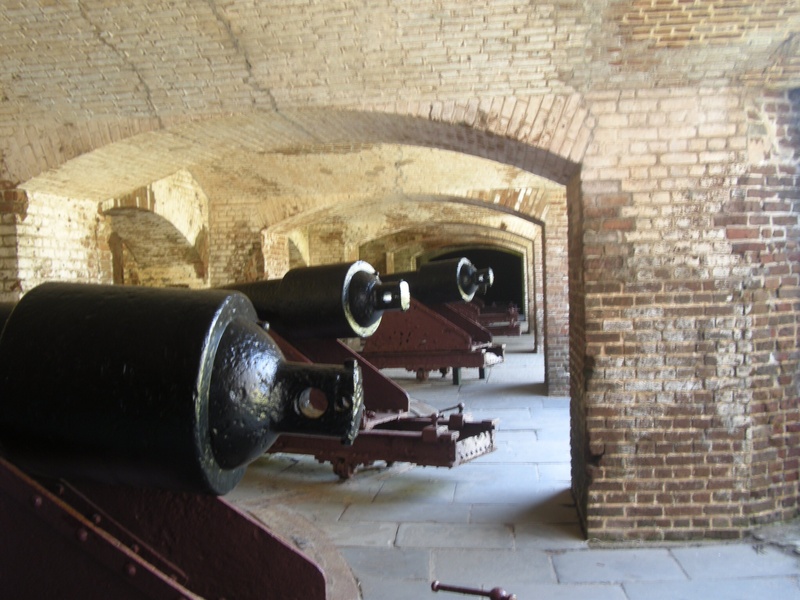 The silent guns at Fort Sumter. The ladies of Charleston arrived in their carriages, parasols waving as they encouraged the men to stand and fight for southern rights and freedom. With this, South Carolina proclaimed that it was willing to fight and to die to preserve its way of life and the southern cause. 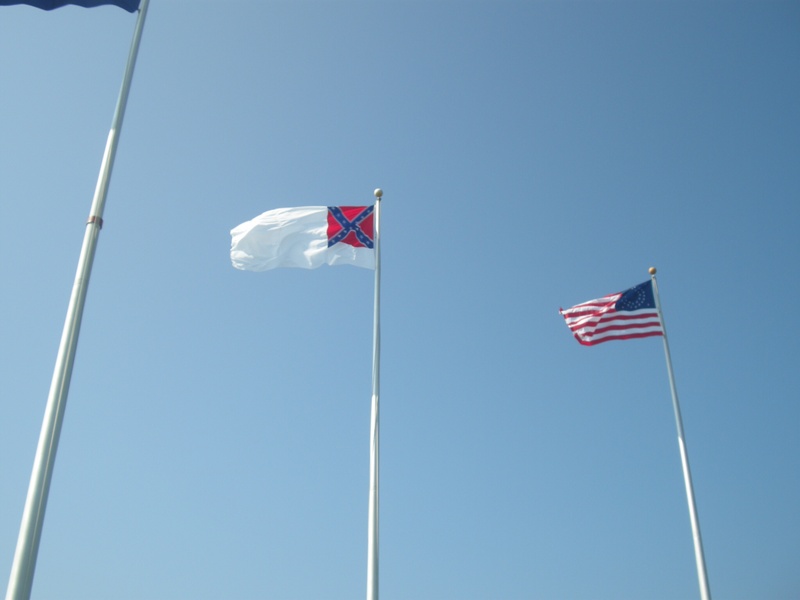 At the fort, which was only abandoned as a military facility after the Second World War, I saw for the first time the flags of the United States of America (USA) and the Confederate States of America (CSA) flying together. 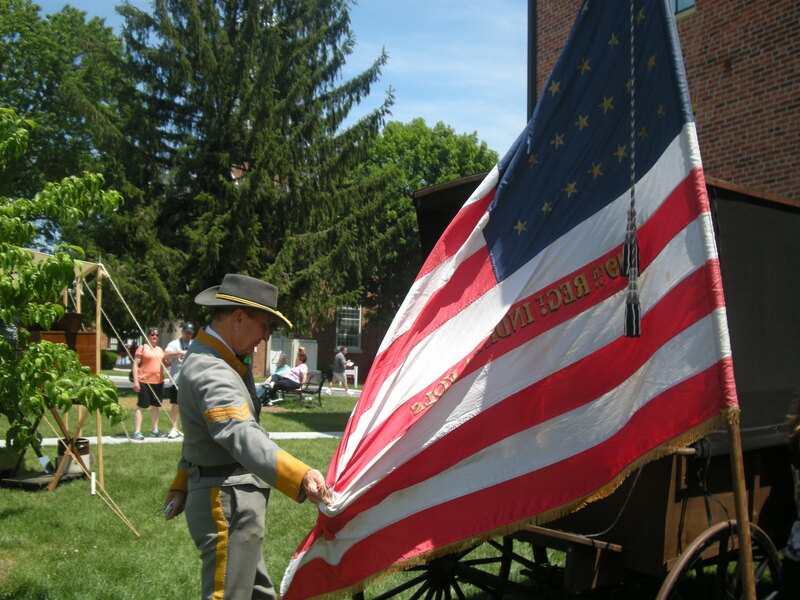 Sumter is now the responsibility of the National Parks Service and, like all the battlefields, it is maintained and preserved for future generations. Looking back towards the city from Fort Sumter. As I stood on the highest point at Fort Sumter and looked back towards Charleston in the hazy distance, I could just make out the Battery. While, as the name ‘the Battery’ suggests, there were guns placed along the length of the water front at this point in 1861, these guns did not take part in the bombardment. The range was too great. Flying together over Fort Sumter. I took my notes and listened to the rangers explain the events that took place here back in 1861 but I have to admit that my mind was on all things ‘eatable’ and my evening ahead at Husk. As the ferry left the dock and headed back toward Charleston, I knew that my journey had formed a life of its own; from now on, my story and my Confederate would lead the way. But first it was time to get something to eat. America is going by in a blur. I’ve hit Civil War overload. It has become all-consuming and I am now missing other aspects, important aspects, of the trip as I travel south. I have decided to loosen the straps of conflict, of the battles and the soldiers, the weapons and the reasons why or why not, and the overwhelming statistics that are all right now threatening to take over my story. It’s time to leave the numbers of dead behind for a while, to put aside the number of bullets used or the amount of bread and fodder consumed by the opposing armies. It’s time to look around and taste something of the countryside through which I am traveling. After all, this is where I have set my story; I need to see what, even if it is 150 years later, it is like to live here. I am driving south through North Carolina and I have decided that I am going to let the somewhat dormant reporter in me bubble to the surface, for a couple of days at least, and ‘report’ on what I see going on around me. When I headed off to the battlefields, I listened to a book on 22 CDs called General Lee and his Army. This got me into the right frame of mind for the history I was about to witness. But now, I have switched off the monotone voice, found a satellite radio station playing non-stop American rock from the 1980s and pointed the car south along Interstate 95. With music from the likes of Whitesnake, Bon Jovi, Bryan Adams and a group called ‘Golden Earring’ as my sound track, I let America unfold before me. Immediately, I noticed the farmland as it varied from county to county and from state to state. From tobacco and corn to peanuts and peaches, the different regions changed with every mile I traveled. I switched off the GPS, left the interstate behind, got lost, found my way again and, for the first time since I got here, began to really see something of the country. I stopped at lonely diners where truckers mixed with farmers as they drank their coffee and ordered their biscuits and gravy or their eggs and grits. Now, for all you ‘grits’ virgins out there, grits is, and my American readers will forgive me here I’m sure, flavourless porridge … well, that’s what it tasted like to me anyway. I eavesdropped on the conversations of fellow diners, which ranged from the cost of animal feed and diesel to baseball and football. One subject that I found repeated from Lancaster to North Carolina is the division that there seems to be between blue collar America and, as one gentleman in White Hill, NC, called them, “those damn environmentalists”. It seems, according to the guys at the counter of the White Hill Diner, that any of these groups that obstruct ‘real’ American jobs, are unpatriotic. “We all need ‘real’ jobs. Not jobs for computer jockeys or call centres but real American jobs,” one man told his fellow diners as they drank their coffee. While he didn’t expand on what ‘real’ American jobs are, I assume these jobs involve heavy machinery, power tools and digging. 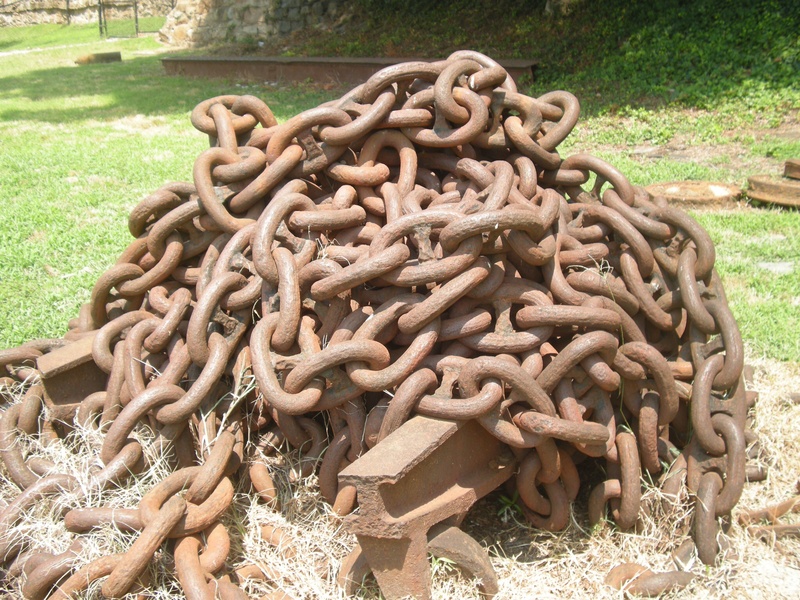 Civil War chains – real American chains made by real Americans. I drove on, back to the interstate, and I began to notice the wonderful advertising billboards and signs that are dotted along the roadside. ‘Grandma’s Gun Shack, for all your shooting needs. Take Exit 13’. Or ‘Finger lickin’ KFC, we’ve got livers and gizzards, Exit 21′. The billboards advertise everything from dog grooming to Viagra, insurance to plastic surgery but my favourite was, ‘Arrested? You need to call Joel at Criminal Lawyers for U’, this with a picture of Joel smiling (or is it sneering?) down on the highway. Then, of course, there are the patriotic signs that manage to advertise the goods or services on offer but also remind the passing drivers that it’s good to be an American. On my way here (to South Carolina), I stopped off at Hampton Roads in Virginia. This expanse of water, which sees the James River empty into Chesapeake Bay, is the site of a famous Civil War naval battle (sorry, but I had to see this) and it was here that the world’s navies were changed for ever. 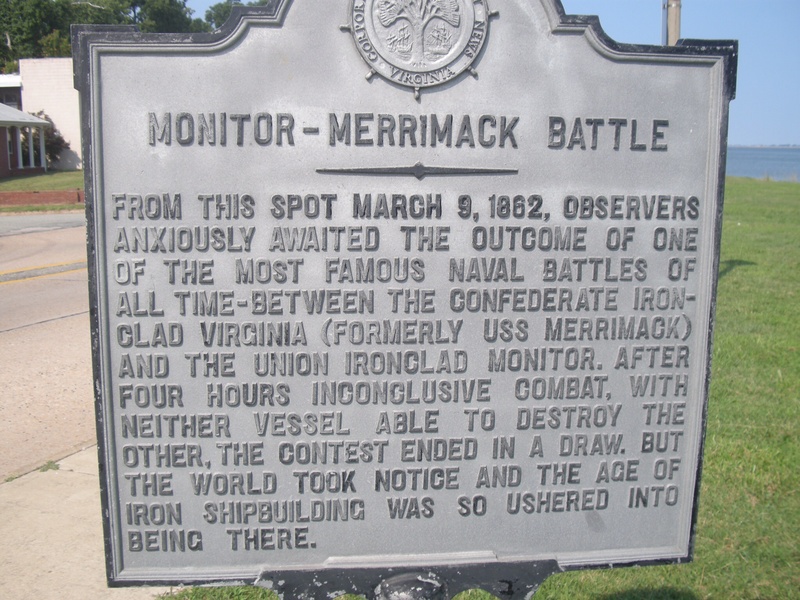 This was the site of the first-ever gun battle between metal or ironclad warships. Anyway, when I arrived, I walked out on to a wooden pier that was the viewing point for many of the locals who turned out to see the battle over 150 years ago. 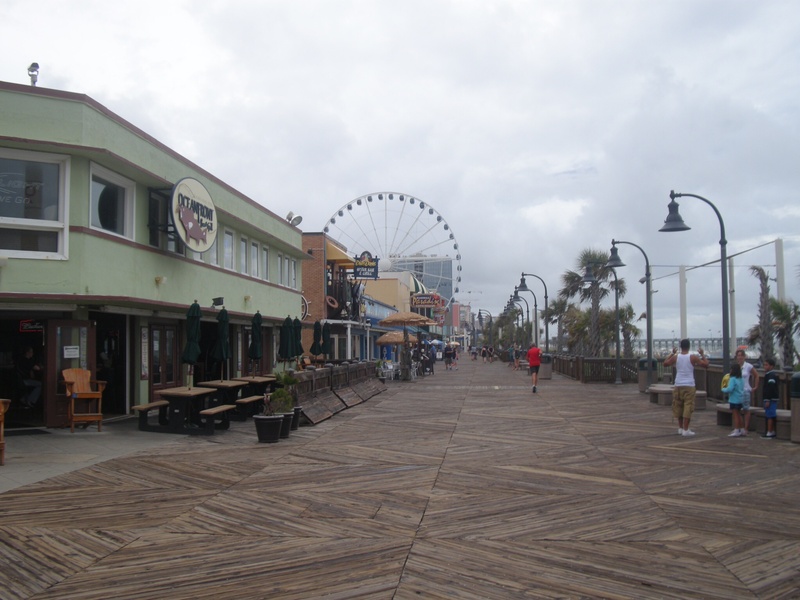 Today, the pier serves as a lovely spot to walk your dog or to catch some fish. 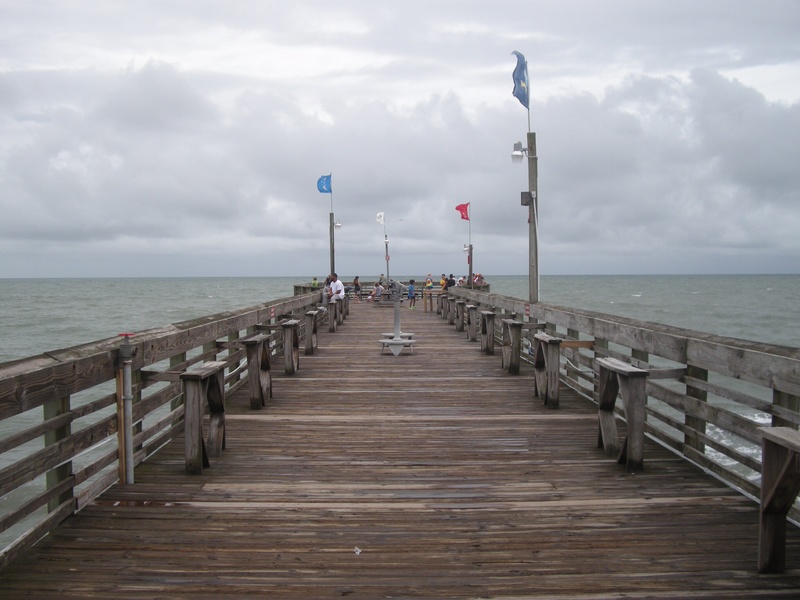 As I made my way to the end of the pier, I noticed a little boy, about 10 years old I’d say, excitedly fighting with the reel on his small, light fishing rod that was almost bent over in a perfect loop. “I’ve got somethin’, I’ve definitely got somethin,” he shouted at his father who was standing next to him. As I watched the little boy ‘fight’ his fish out of the water and on to the pier, other fishermen called out encouragement and as the fish – it looked like a plaice or a flounder or some other species of flat fish to me – was lifted clean out of the water and on to the pier, there was a big round of applause from all present. Clearly, not one of those unpatriotic environmentalists then. Click your fingers. Click them again. Now click them every second for six hours. If you could manage to do this, and still feel your fingers and hands, you would have clicked 21,600 times. That’s the number of soldiers who were killed or wounded in the same six-hour period on the battlefield of Antietam. 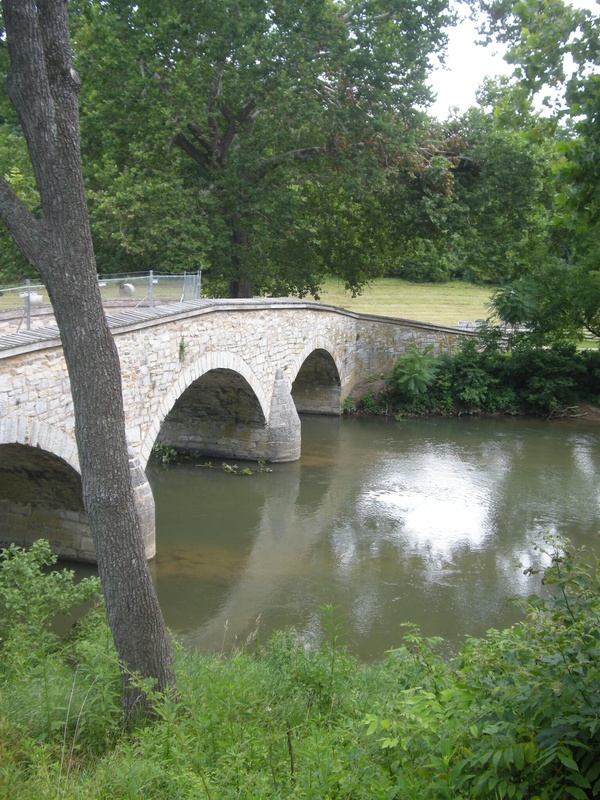 Antietam is a river, or as they say over here, a creek, snaking its way through the rolling countryside outside the little town of Sharpsburg, Maryland. This town was another one of those quiet, peaceful places caught up in the war that was raging around it. Peaceful that is until the army of Northern Virginia and the army of the Potomac found themselves drawn together for what was to be the single bloodiest day of the American Civil War. You’ll have to forgive me; my trip is not in chronological order and to tell the story of the battle at Antietam we have to go back to September 1862, that’s almost a year before Gettysburg. Bear in mind that while Gettysburg was fought over three days and inflicted more than 50,000 casualties, a mind-boggling number, Antietam was fought in just one day, one day with over 21,000 men dead or wounded. As I made my way to Maryland from Pennsylvania, I tried to imagine the impact of this battle on the people who back home around their fireplaces in New York, Washington, Richmond and Charleston read about the battle and saw the casualties list printed in their local papers. This type of warfare was totally unheard of here in America and it was not until the bloody battles of the First World War, 52 years later, that these numbers of dead and wounded would be surpassed. 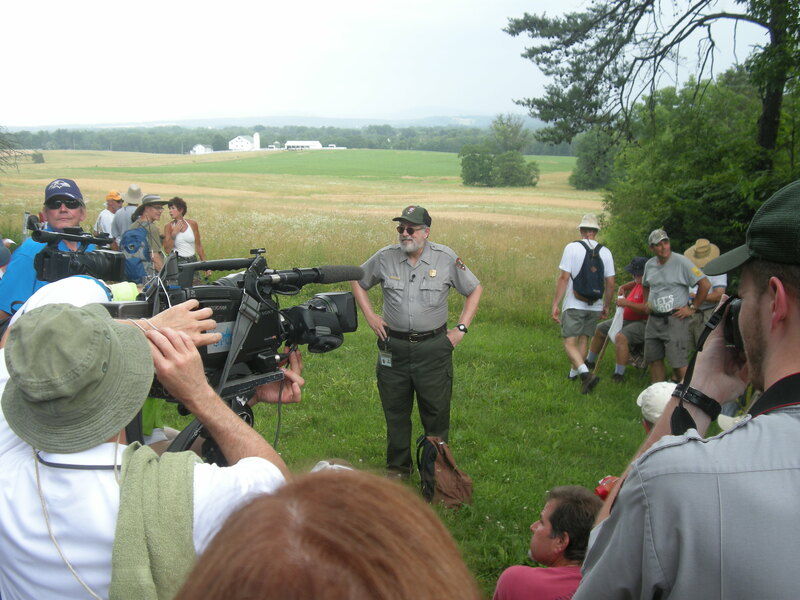 When George W. and I arrived at Antietam’s visitor centre, what first struck me was how small the battlefield is. The numbers of dead and wounded had a lot to do with the clash of the two armies in such a small space but it was also the result of the sheer violence and determination with which both sides set about their grizzly work on that day in September, 1862. Long after the battle, local farmers would find relics of the death and destruction wrought over their lands and their homes. One farmer found evidence of just how much of a storm of lead the two armies produced when he found two Minié balls (bullets) embedded together. These bullets had collided in mid-air. Imagine the numbers of bullets flying through the air to create this piece of Civil War memorabilia? Anyway, my first stop, which was within walking distance of the visitor centre, is perhaps one of the unlikeliest buildings you’ll find on a battlefield anywhere in the world. 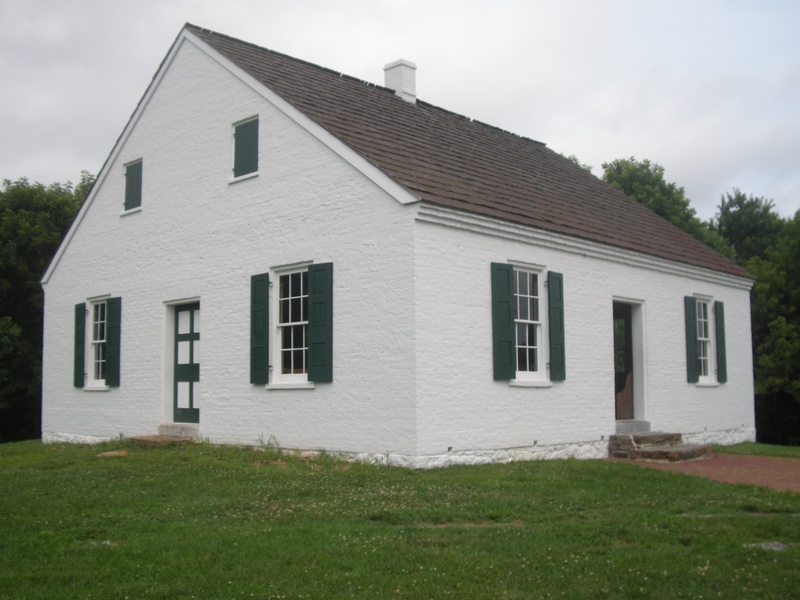 The Dunker Church, a simple, white, wooden cabin, that on the day of the battle stood directly in the path of the two armies as they deployed to face one another, was the place of worship for a German pacifist sect that had settled in the area many generations before. It is ironic that soon this pacifist church would bear witness to so much brutality. I don’t want to get too deeply into the history of that day back in 1862. I think that I have become numb and desensitized to the sheer violence of the conflict in which I have set my story; I feel I have to ease up on the battlefield fact and figures. Anyway, this battle, like all those before it and after, was supposed to end the war. On the Union side, they saw Antietam as an opportunity to deal the Rebel Confederates a knock-out blow and then capture Richmond and restore the Union. For the Confederates, Antietam was to be the battle that would force the Union to sue for peace and would also result in international recognition for the cause of southern freedom. Neither side would achieve its goals. Antietam should have been a great victory for the Yankees; after all, they had the complete plans and troop dispositions of the Rebel army. In an amazing stroke of luck, the Union general in charge, the 35 year-old boy general, General George B. McClellan obtained an order sent from General Lee to one of his field commanders. This order outlined his plans for the coming battle and explained where he wanted the troops deployed. These plans were found by two Union soldiers on the roadside wrapped around three cigars. The Wheat Field where the Irish marched towards the Sunken Lane. But even with these battle plans, and with Union forces almost twice the size of his opponent’s, McClellan was unable to destroy General Lee and his Rebel army. Nevertheless, Antietam was, in some ways, a Union victory. Lee did retreat back into Virginia but his army remainedl intact, badly bloodied, but still a dangerous force ready to come out and do battle again. McClellan was convinced that Lee had a much bigger army and he had to ensure that he was able to protect Washington. This was the excuse to his President when he tried to explain why he did not pursue and destroy the Army of Northern Virginia. Lincoln didn’t believe him and soon after the battle McClellan was replaced as commander of the Army of the Potomac. There is, however, one action during this battle that I have to mention. 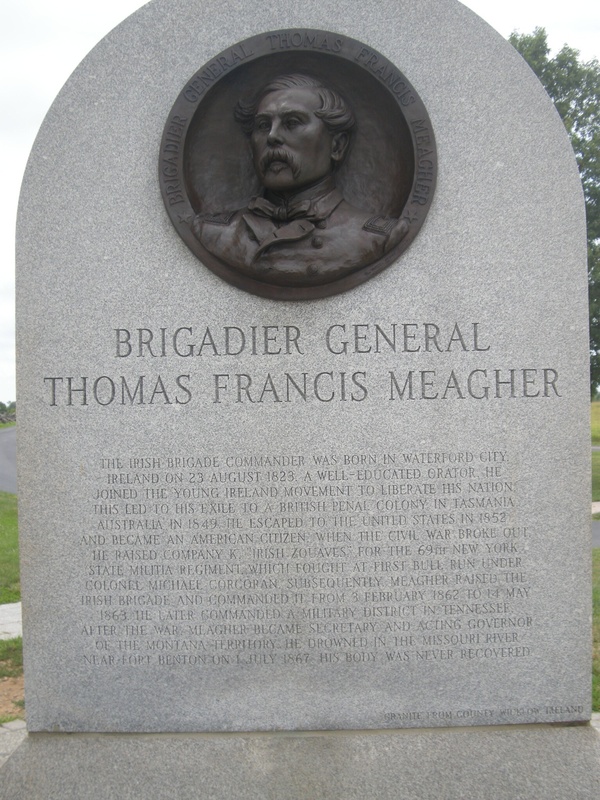 Once again, it involves the Union Irish Brigade and, once again, they march straight into the storm of metal that left many of them dead and wounded. And again, they, the now famous Irishmen of the Union army, waded knee-deep in the blood of the Confederates they met in the sunken lane. The Sunken Lane was (and still is) a ready-made trench and the Rebels poured into the lane and began to take a terrible toll on the advancing Yankees. Then, the green flag appeared and the Irish marched out of a corn field and headed straight for the waiting Confederates. As the Irish poured fire into the lane, the tightly-packed Rebels began to suffer terribly as men fell, causing the once perfect trench to become a lane-way filled with the dead and dying. Some of the Irish made it to the end of the lane and from this position began to fire into the flanks and the rear of the Rebels, who by now were trying to retreat out of the Sunken Lane and form a new battle line in a better position. As the Irish crossed the fence line and looked down into the lane, the sight that met them was indeed horrifying. “The lane was full of blood, many of the wounded were buried under their dead comrades and were calling for mercy. I have never seen so much pain and suffering and I have no desire to see its likes again,” Private John McCarthy of the 69th New York Infantry wrote to his father after the battle. 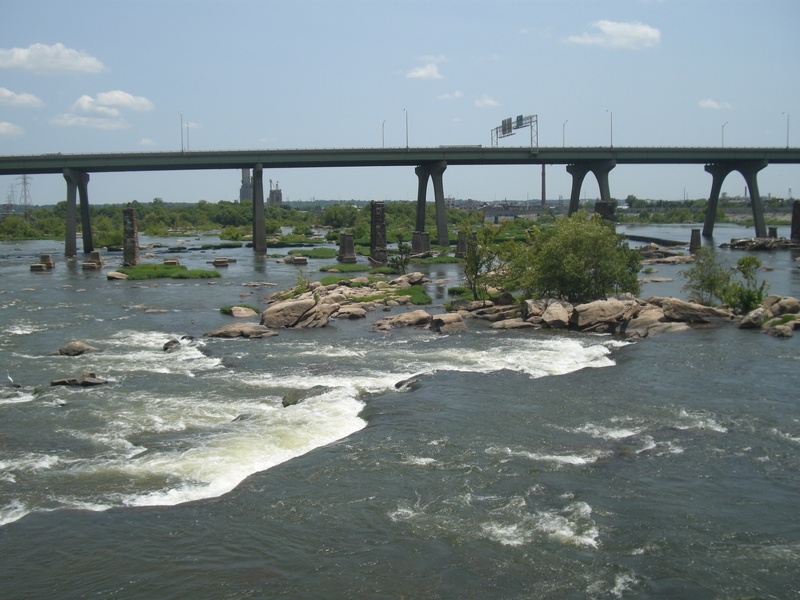 But now, it’s time to move on; to move on to Richmond and the gateway to the south. It’s time to bring the Confederate home. 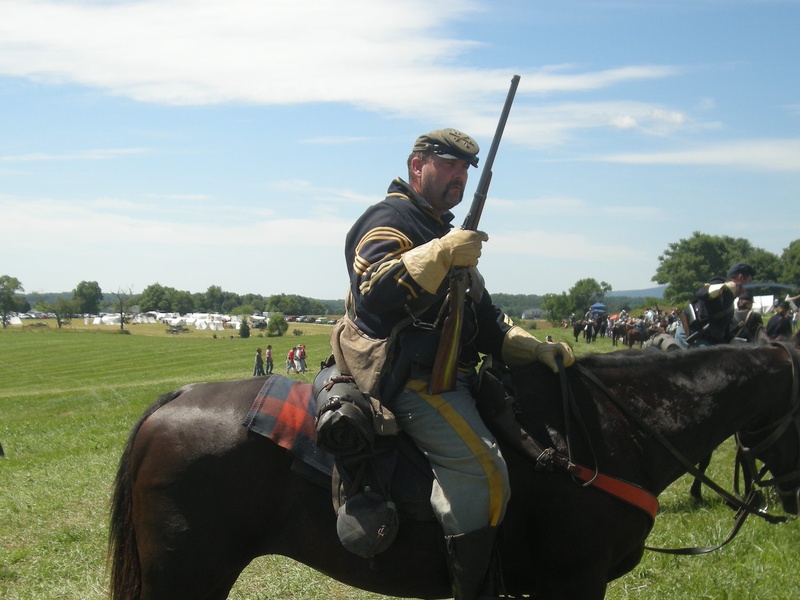 Gettysburg Day 3 – The wave recedes. As I woke on this my final morning in Gettysburg, I knew that today was not only the end of my time here at the battlefield; it was also on this day 151 years ago that the Army of Northern Virginia was about ready for what they hoped would be their final, and ultimately successful, assault on the Union forces still entrenched behind their lines on Cemetery Ridge. I walked out onto the battlefield at Cemetery Ridge, only a short stroll from my motel, and from my position on the ridge looked out over what was the entire battlefield all the way to the Round Tops at the far end of the field. There was a mist hanging over the field as the sun worked to burn off the early morning dew. In my mind, I could see the troops on either side stirring in the early morning light. The sounds of soldiers cooking what breakfast they had, the pickets (sentries) on both sides watching, and in some cases calling greetings to each other across the fields, and, of course, the sound of the wounded, many of whom had spent the night in agony between the lines. 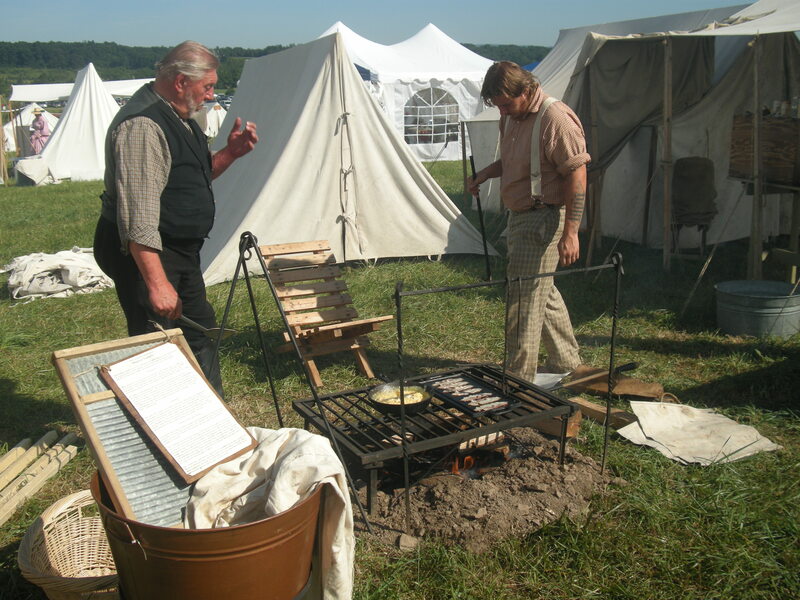 Breakfast time in the Confederate camp. The ground would have been littered with the dead and the dying. All along the line, there were smashed guns, destroyed wagons, dead horses and wounded soldiers calling out for help. With that vista before him, General Lee knew that he had only enough supplies of men and ammunition for one more push. This was the final day that he could stay here. If he did not succeed today, he would have to retreat back to Virginia and shorten his supply lines. 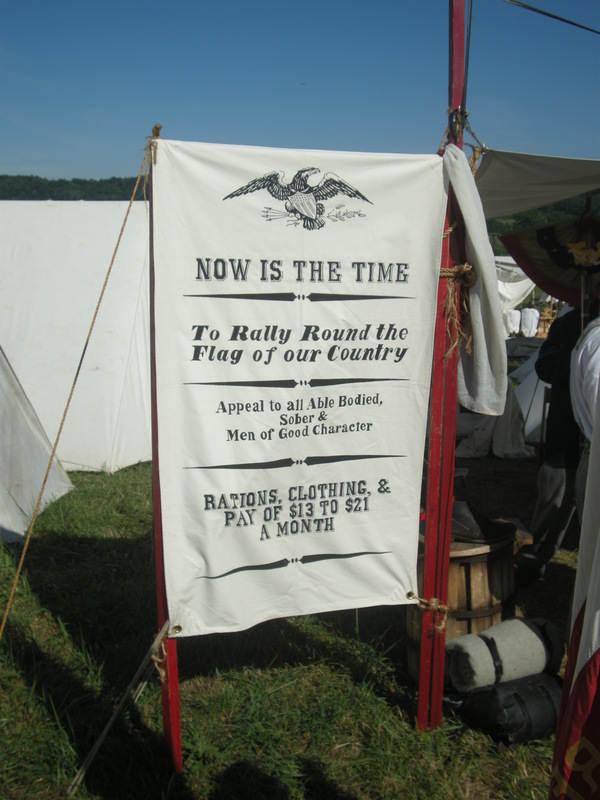 With this in mind, and with the carnage of the last two days everywhere to be seen, the commanding General outlined his plans for July 3rd 1863. General Lee’s attempts to break the Union lines, first on the right, and then on the left, had both failed. General Longstreet advised, once more, moving around the Union lines, getting between General Meade and Washington, finding ‘good ground’ and forcing the Federals to attack the Confederates where they would have the advantages of entrenching and forming a defensive line. This would, Longstreet told his commanding General, ‘force the enemy to smash themselves against our defensive walls’. In hindsight, this seemed a very sensible plan. But General Lee had other ideas. The good General could see that the Union strength was strongest at both ends of their line: at Culp’s Hill and on the Round Tops. Therefore, he surmised that the centre of the line must be the weakest point. There would be no movement around the Yankees; the army would attack the centre and split the Union line in two, forcing them to retreat. This plan was not without its merits. The Union line was indeed at its weakest in the centre and the Confederates had General Pickett’s division of over 5,000 fresh troops, which had yet to see any fighting at Gettysburg. 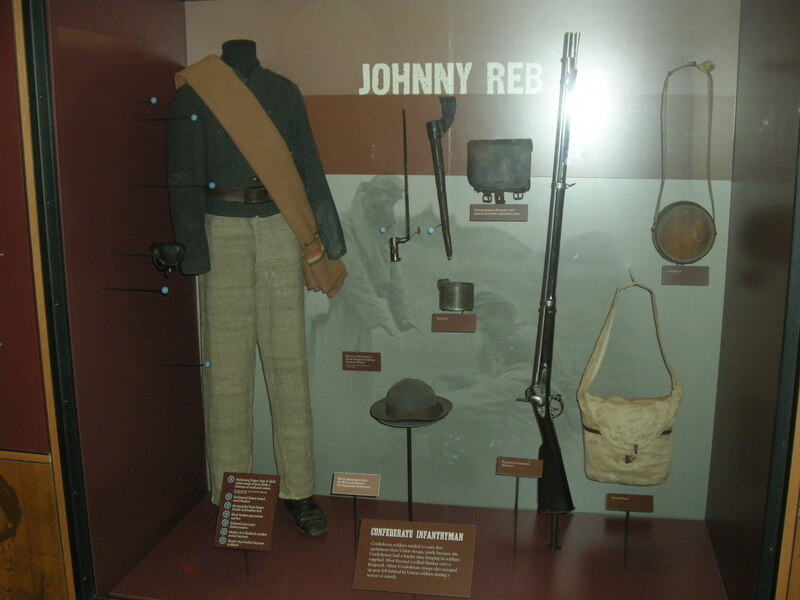 Johnny Reb prepares for another day at Gettysburg. Lee also ordered what was the biggest bombardment of the war, so far, when he placed over 150 cannon so that they could concentrate their fire on, this, the centre of the enemy lines. Two more divisions were added to Pickett’s, bringing the total to over 12,500 troops ready for the assault. While General Longstreet would have command of the operation, he was not at all happy with this plan. As the troops began to assemble in the woods facing the Union line and the artillery rumbled into place, General Longstreet tried one more time to persuade Lee to rethink his plans and to move around the Federal line. However, General Lee was set on the course he had chosen and, with this decision made, the artillery prepared to fire. 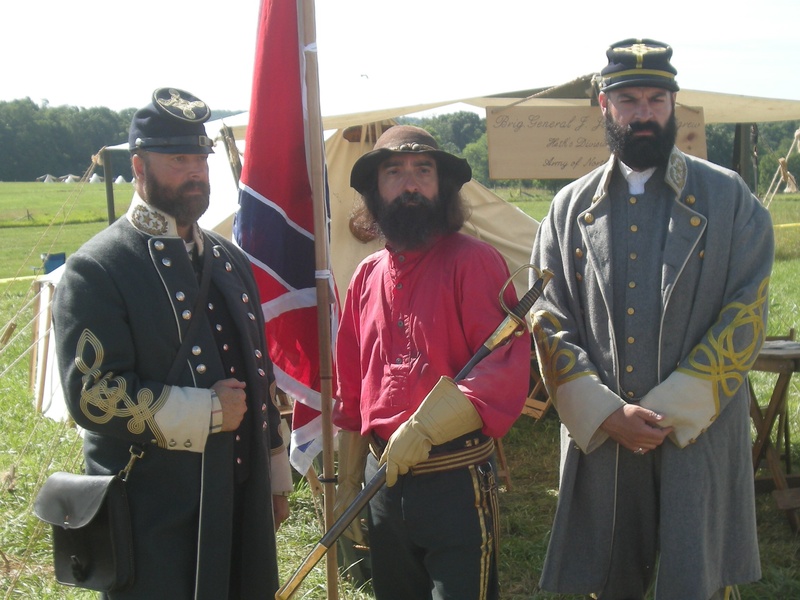 The Confederate Generals steel themselves for the coming battle. On the Federal side, as the morning dragged on and the heat of the sun once again beat fiercely on both armies, Union General Hancock watched as the Confederates placed their cannon. He had just over 5,000 men in his position behind a stone wall. It was a strong position and General Hancock like many of the officers on the Union side felt that today, July 3rd, after all the death and destruction of the last two days, would be quiet. He was about to be proved wrong. I left Cemetery Ridge and drove to Spangler’s Woods where Pickett’s Division prepared to make their assault 151 years ago. The tree line here stretches almost from one corner of the battlefield to the other and behind these trees, hidden from the Federals on Cemetery Ridge, the Confederates prepared for their final push, this final offensive, that would cut the Union army in two and win the battle. Moving the artillery into position. Here, all along the tree line, the artillery was ready and as I walked out into the field between the two lines, there was that strange silence again. From Spangler’s Wood, the ground looks flat and even all the way across to the Union lines but it’s not; there are a series of dips to negotiate as well as the Emmitsburg Road, which with its post and rail fencing would also have to be crossed. The killing field. The tree line in the distance is Spangler’s Wood where the charge began. You can see the traffic on the Emmitsburg Road and the photo was taken behind the Stone wall at the Union line. I could clearly see the Union lines and I knew that all along this ridge were placed many cannon and over 5,000 rifles ready and waiting behind the stone wall. All 150 cannon fired. 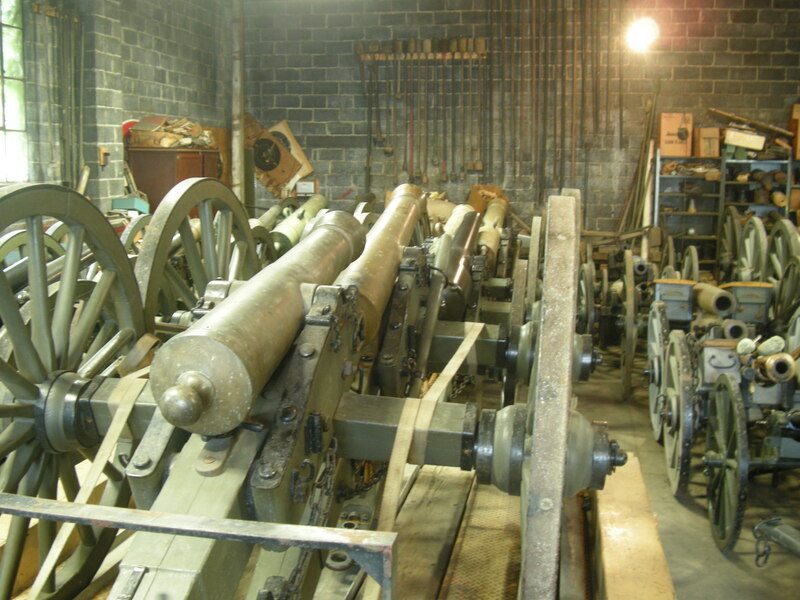 The sound of these guns were heard, it is said, as far away as Harrisburg and Philadelphia. 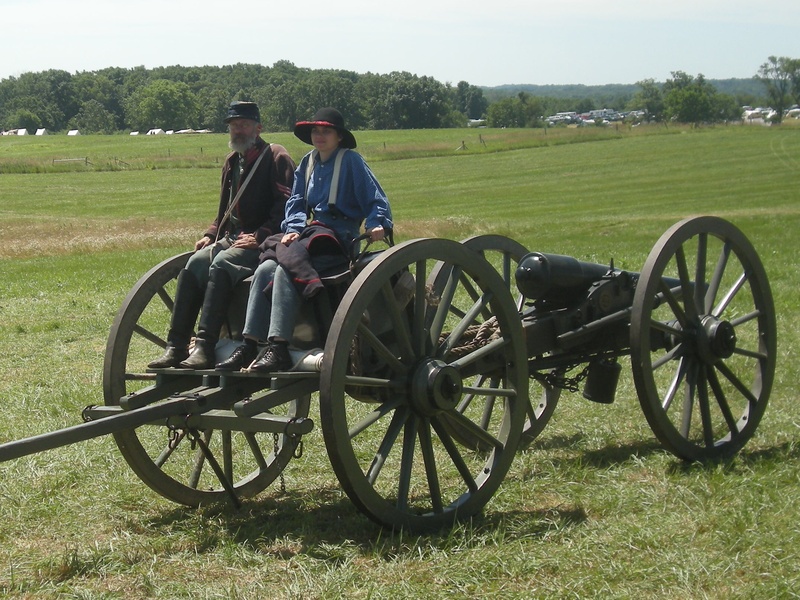 The cannonade continued for over one hour as the Rebels fired shell after shell into the Union position. The Union guns at first did not return fire as they now knew that this bombardment meant only one thing…that ‘Johnny Reb’ would soon be on his way and they needed to conserve their ammunition for the onslaught that was about to begin. The Federal soldiers hugged the ground or looked for whatever little cover they could find against the exploding shells and the rain of metal that were now falling amongst them. Men were cut to pieces as razor-sharp fragments from the exploding shells tore into them while they tried to shelter from the fire. This doctor is going to be very busy. As suddenly as the shelling started it stopped and when the Yankees got to their feet and looked out over the battlefield, towards Seminary Ridge, they were amazed at what they saw. As I stood in the middle of the field, half-way between Seminary and Cemetery Ridge, I looked back towards the tree line and imagined the scene that was about to unfold over 151 years ago on this day at this very moment. Extending for a distance of one mile, the Confederate Divisions stepped out of the woods: some 12,500 men following their flags and their regiment bands stepped out into the open ground. The Confederates marched upright, standing shoulder to shoulder; their officers out in front leading their men on with their swords pointing the way. As the Yankee soldiers looked on in awe, the Union artillery began to fire. All along the Union line, from left to right, the cannon fired into the advancing line of Confederate infantry. Holes started to appear in the long grey line as the shells began to take their toll. With each exploding shell, scores of Rebels were cut down; when each shell smashed holes in the line, the soldiers calmly moved together to fills these gaps. They did not run or look for cover, they just moved together to recover the line and march on into the storm. When they reached where I was now standing, in the first dip, they must have thought that they would have had some cover from the Union guns. Unfortunately, the Yankee cannon on either end of the line had a clear view of the Rebels in this shallow trench and, as their guns fired, the slaughter continued. 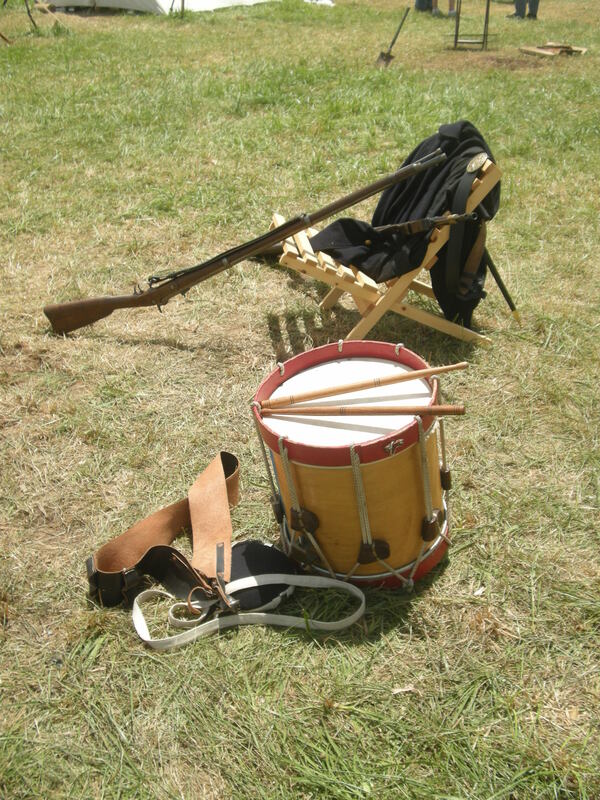 The drum and the gun. Even now, with the intensity of fire coming from their front and from either flank (side), the grey line continued. As they marched on, they soon came into range of the Union soldiers and their rifles waiting behind the stone wall. There was a thunderous volley as the entire Union line exploded from left to right with rifle volley after rifle volley from the waiting Yankee soldiers. Again the grey line stumbled, seemed to shake for a moment, and then continued the march towards the Yankees on the ridge, leaving scores more dead and wounded in their wake. Hundreds were dead and wounded but the Rebels came on still, marching upright and following their flags. 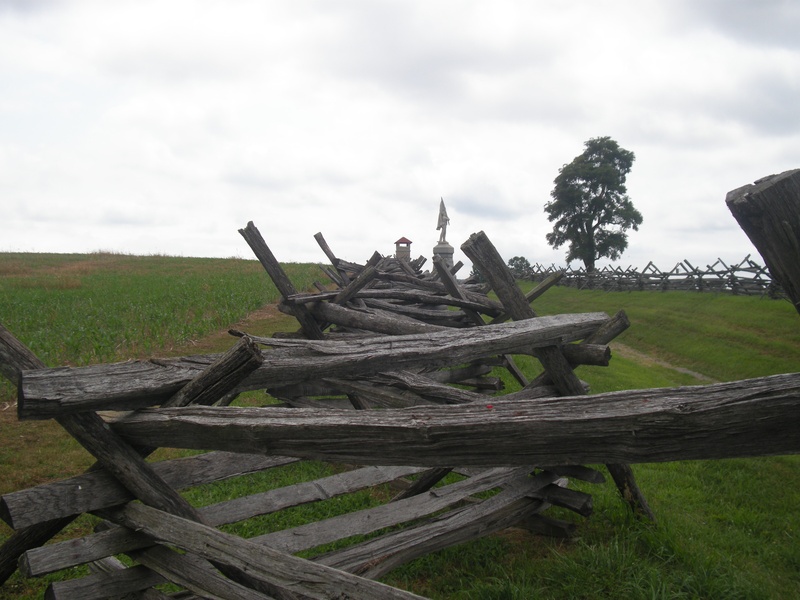 As the Confederates reached the Emmitsburg Road, they were forced to stop to dismantle the post and rail fencing. 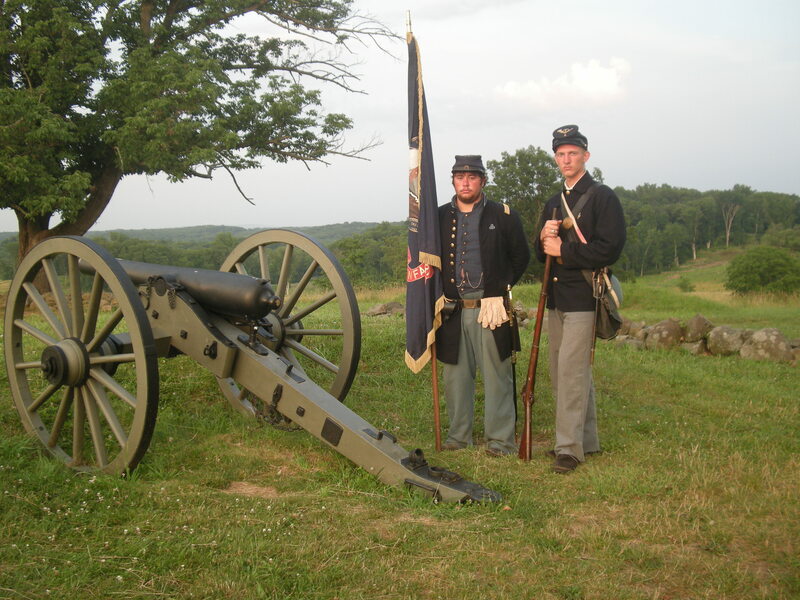 The fence removed, the Rebels continued their advance and now, as the rifles on the ridge continued to cause havoc and death all along the line, the Union artillery opened up with canister ammunition. Canister shells have been described by those who have seen their effect on massed infantry as nothing short of horrendous. The shell is, as the name suggests, in the shape of a long canister made of tin. 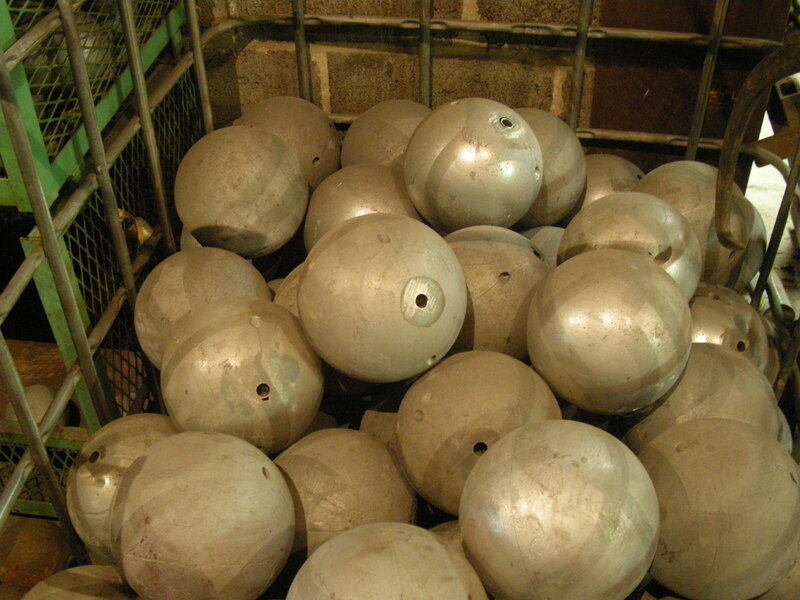 Inside the canister is packed twenty to thirty metal balls, about the size of a tennis ball. 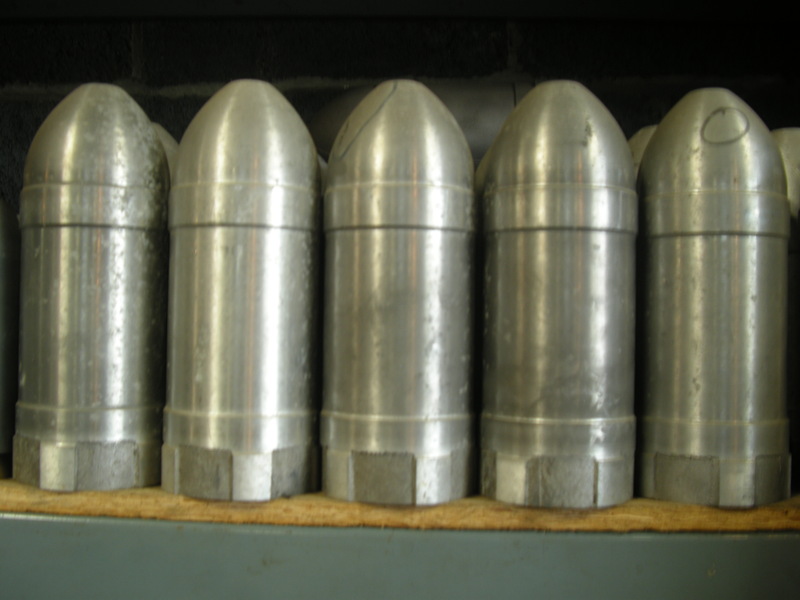 When this canister is fired from a cannon, the tin container disintegrates and the metal balls spread out in a cone shape. Twenty Union cannon now began a sustained canister bombardment into the advancing and ever-decreasing Confederate line. Eyewitnesses reported seeing whole sections of soldiers simply disappear as the canister shot tore men to pieces. The Rebel line was now concentrating on a clump of trees in the centre of the Union line. 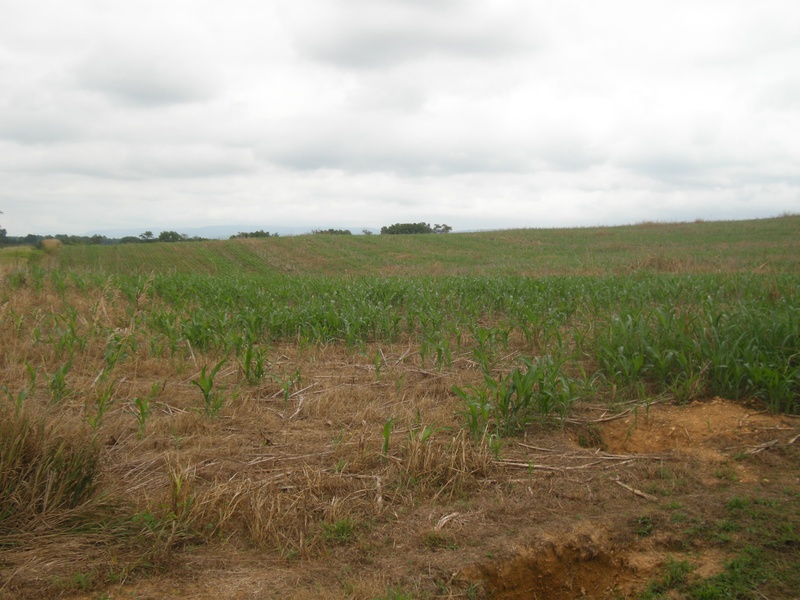 Here, what was left of the Confederate division would make their final assault. So, as they advanced through the hail of canister, bullets and shells, the shrinking number of regiments and brigades began to contract towards the centre. This allowed the Federal units at either flank of the line to swing out of their positions and pour fire into the Confederate line from each end. By now, the Rebels were taking fire from three sides. I moved on. The idea of so much death and destruction at this very point, right here where I was standing was, I must admit, very unsettling. These soldiers were not green recruits who had never seen a battle before and therefore didn’t know what to expect. These men had already campaigned hard for over two bloody years. They knew, every one of them knew, what was going to happen when they stepped out of those woods that morning. And still they stood up and walked out to face death and destruction. I crossed over to the Union line and stood behind the stone wall looking out onto the ground where ‘Pickett’s Charge’ came to its bloody end. With fire concentrated on what was left of the Confederate advance, the line began to finally crumble. 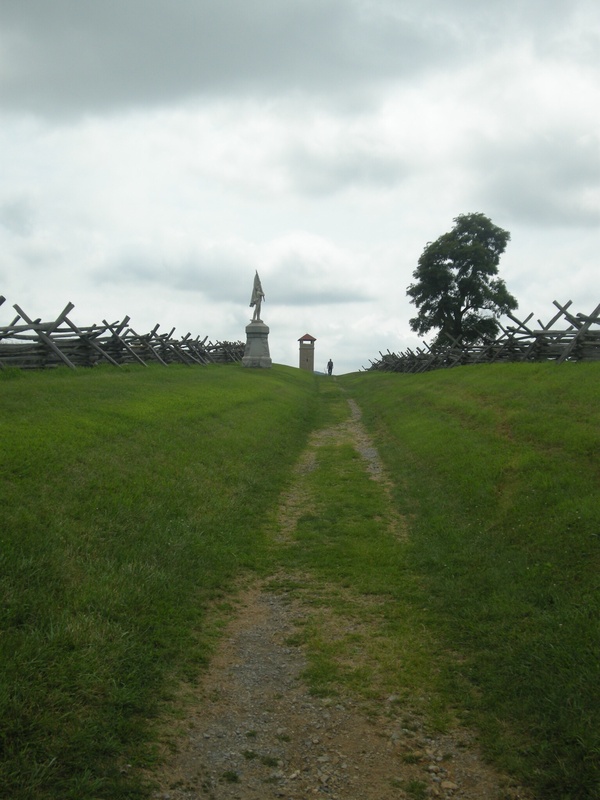 A few hundred made it to the wall where I was now standing but they were either killed or captured by the Union soldiers who were being steadily reinforced. While what was left of the Rebel divisions turned and moved off back towards the woods where their bloody charge had begun, the words ‘Fredricksburg, Fredricksburg’ could be heard, as the Union soldiers began to chant these words repeatedly. ‘Fredricksburg, Fredricksburg’, over and over again. The reason for this unusual chant and the mention of the Virginian town? Well, that’s for another blog and another story of bloodshed, slaughter and unbelievable valor. Of the 12,500 men that left the woods, less than 3,000 arrived back without some sort of wound. ‘The field is covered in blood,’ one wounded soldier told General Lee as he sat visibly shaken on his horse ‘Traveller’ and watched his men return from their attack on the Federal lines. Lee now faced a very serious situation. He was sure that the Federals must now launch a counter-attack against his shattered line, which, he could see, had been decimated. He tried to form some sort of defensive line and then he waited for the Union army to swarm out of their defensive positions to crush his shattered army. But nothing happened. Lee re-organised his army and waited. Still there was no movement from the Federal line and, after a day of waiting, Lee ordered his army back into Virginia. Gettysburg was a Union victory but there was still further death and slaughter to come. The bloodshed would continue for two more horrible years. A very young recruit answering the call. After yesterday’s ‘forced march’, I decided to use the car today while out on the battlefield. 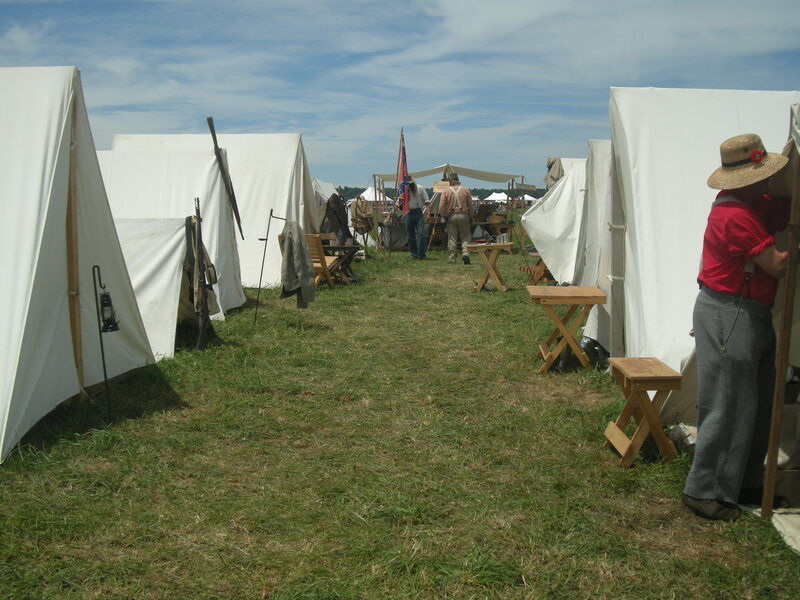 On 2 July, 1863, both armies had settled on the ground where they would continue the slaughter. The Union lines led from Culp’s Hill to Cemetery Ridge down to the Round Tops (two small hills) at the far end of the field. 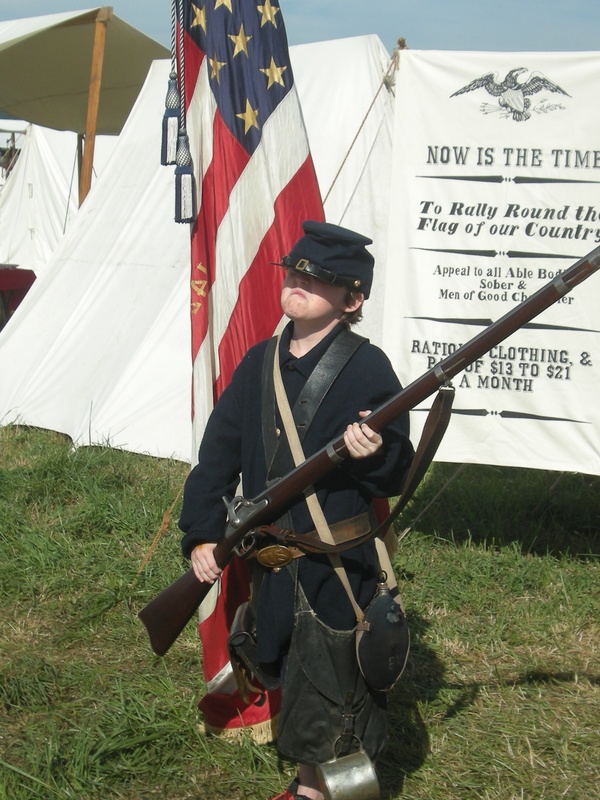 The Union line looked like a large fish hook and facing this fish hook, from end to end, was the Army of Northern Virginia, ready on this second day to push the Yankees out of their positions and deliver the knock-out blow. Union infantry on Cemetery Hill. ‘Ol’ Bobby Lee’, as the Confederate General was known, decided to attack the left flank of the line and then, all going well, ‘roll up’ the Union defenses across the top of Seminary Ridge. To do this, he sent Lt. General James Longstreet and his corps to take the Union position on Little Round Top. And that’s where I headed first. 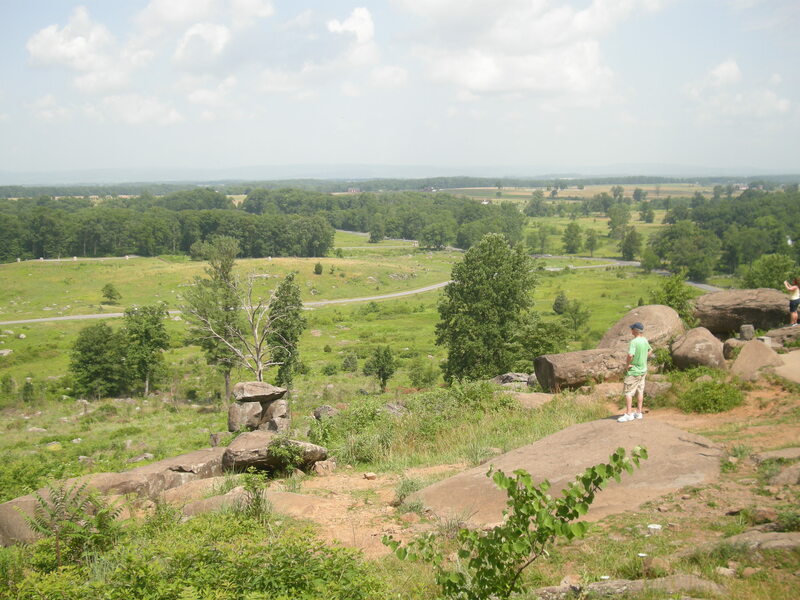 Little Round Top is a rocky hill at the far end of the battlefield and as General Longstreet got his corps ready for the attack it was completely undefended. Imagine, if you will, a hilltop covered with very large stones and boulders, not particularly steep but difficult terrain nonetheless. Early that morning, there had been over ten thousand Union troops positioned on this part of the line but their commanding general, Major-General Daniel Sickles, a Washington politician, didn’t like where his troops were. Without orders, he moved his entire corps (all 10,000) out of the excellent positions on the Round Tops and down into the area known as the Wheatfield, the Peach Orchard and the aptly named Devil’s Den. His corps, now completely exposed to the incredible fire of the Rebel guns, was soon decimated and the good Major General’s rash actions cost him a leg. There were many Irishmen with Gen. Sickles in the Wheatfield and Devil’s Den that day. 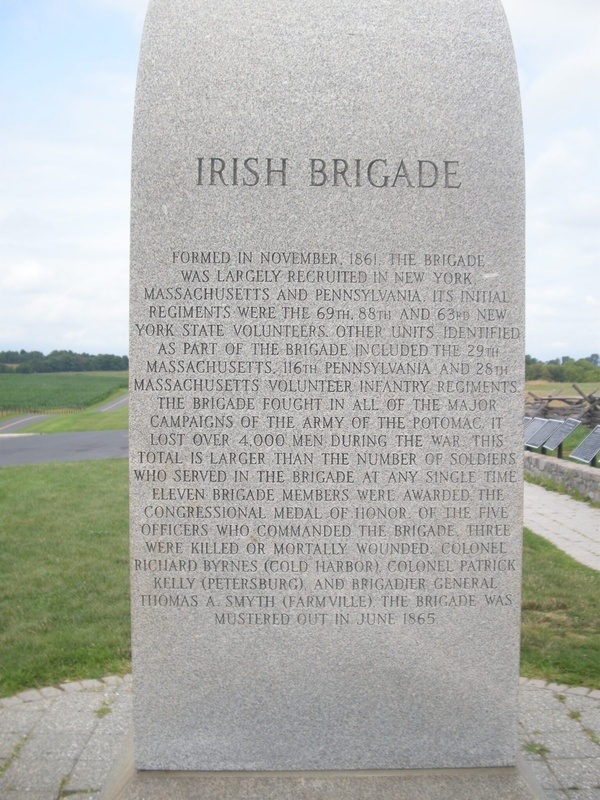 The famous Union Irish Brigade was there and like all good Irishmen they had a mass before they picked up their rifles and headed out to slaughter their fellow man. 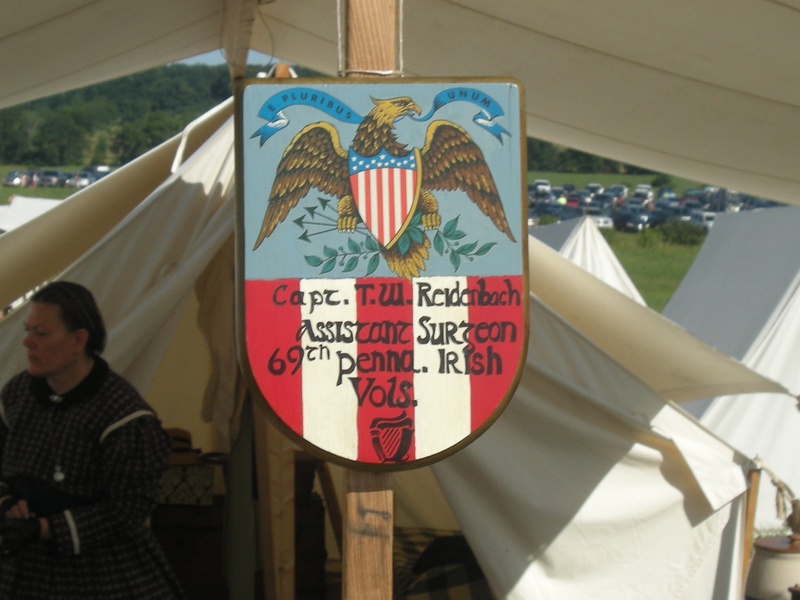 Many of those waiting for the Irish Brigade were their fellow countrymen fighting for the Confederacy: men from Georgia, South Carolina, and Louisiana. In fact, most of the regiments on both sides had large numbers of Irishmen in their ranks. 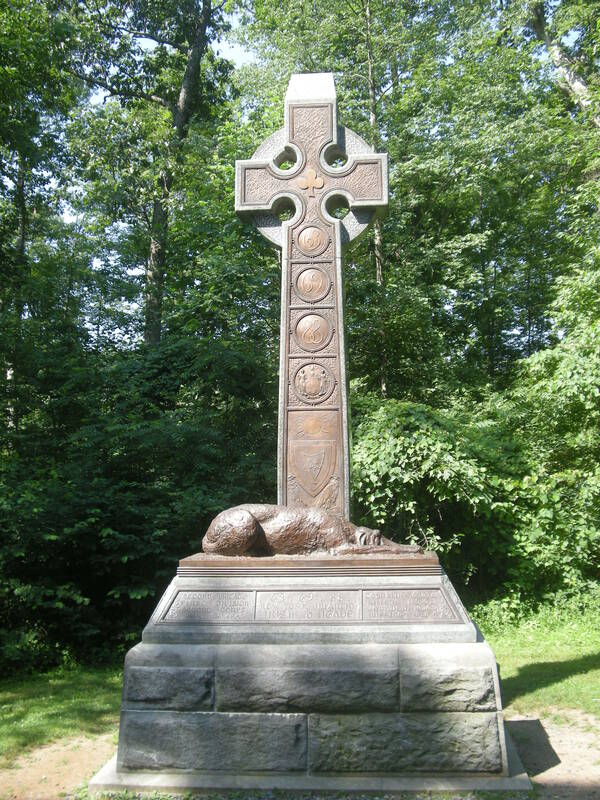 The monument to the Irish Brigade in the Wheatfield. Most of these men were born in Ireland and had been arriving in America from the early 1840s. It seems no matter where we go we find it very easy to kill one another. When I arrived at Little Round Top, I was struck by the size of the place. On maps you get the feeling that the area is large and has plenty of room to manoeuver. In reality, it’s like an open-topped box, narrow and deep. I could imagine the Rebels moving into position below while the Union soldiers could see every move they made. The view from Little Round Top, looking to the Wheatfield below at the tree line. Today, a bus tour of students from California are occupying the position and are climbing all over the boulders on Little Round Top; chasing one another and laughing, their teacher and guide trying in vain to get them to listen to the story of the battle for this hill over 150 years ago on this very day. I can see the Wheatfield and Devil’s Den very clearly. While the Irish were fighting and dying down there, up here on Little Round Top, a passing Union General saw how exposed this part of the field was, thanks to Major-General Sickles. 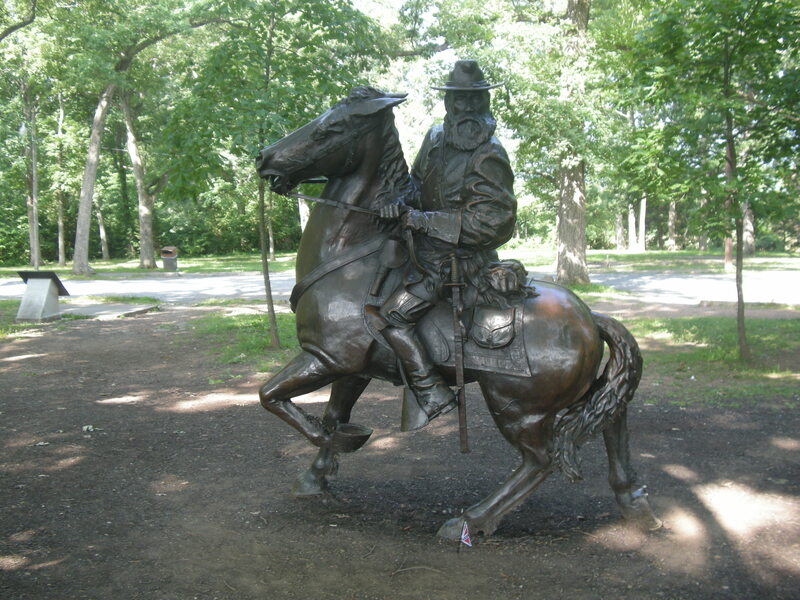 He also saw Gen. Longstreet moving his 1st corps into position getting ready to march unmolested up Little Round Top. This General was an engineer and he knew that this position was the key to the entire Union line. Without waiting for orders, Gen. Warren moved two Union brigades into position on Little Round Top. What followed was described by one Confederate officer as ‘pure slaughter’, as again and again the Rebels smashed themselves against the well-prepared Yankees at the top of the boulder-strewn hill. 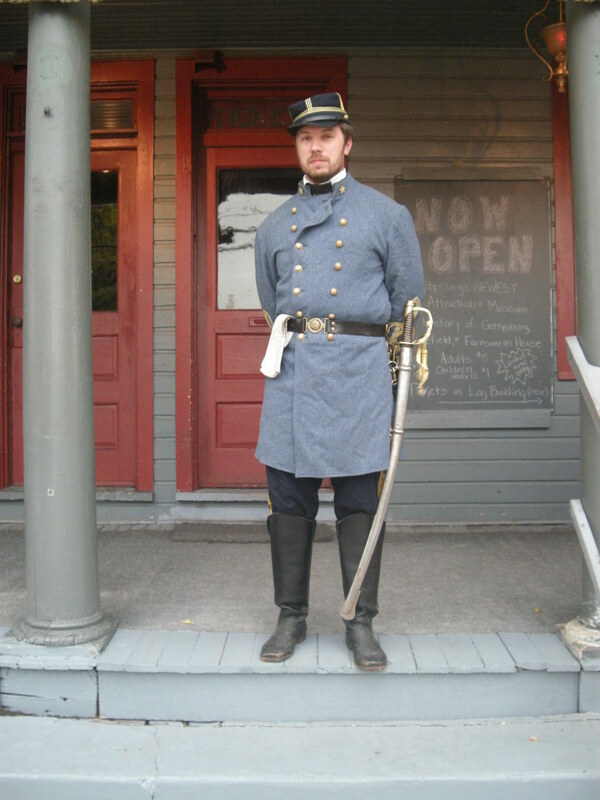 A Confederate officer in Gettysburg. I sat on one of the boulders trying to imagine the struggling men making their way up the hill, shots ricocheting off the rocks, bayonets clashing and men clubbing each other to death. As the sun went down on Little Round Top at the end of the second day, the dead and dying covered the hill top. But the position held. I then went in search of the Irish Brigade Monument, which is down in the Wheatfield. 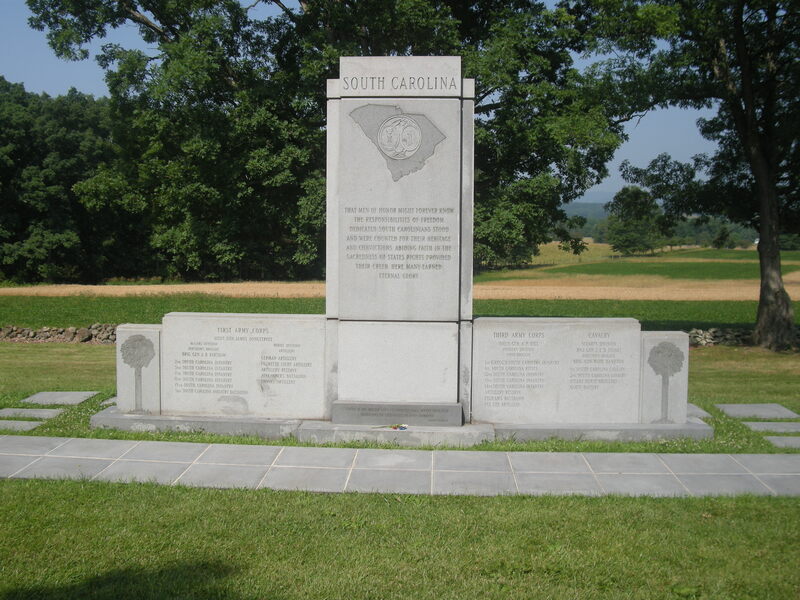 Each unit has its own monument, placed where they saw action on the field, and each of the States that had men fighting here also have their own monuments. Some are small, a stone with the details of those units involved and perhaps a simple poem. Others are large, very large, with the Pennsylvania Monument dwarfing all the rest. This monument is bigger than most churches back home. The South Carolina Monument on Seminary Ridge. From the Irish Brigade Monument, I headed for the Gettysburg visitor centre and I can only use the word ‘spectacular’ to describe this building. Part museum, part theatre, this building contains everything from actual weapons and uniforms used at the battle, medical equipment, food stores left behind by the army, prayer books and letters to a 360-degree painting of the battle. One of the incredible exhibits at the Gettysburg Visitors Centre. This mega painting is 366ft long (112m) and 47ft high (14.5m), and was created by French artist Paul Philippoteaux back in the 1880s. The painting is housed in a dome-shaped room and when you enter you are positioned as if in the middle of the battlefield. It is incredible. My only regret is that I have no photos of this cyclorama as it is called. Flash photography isn’t allowed and you need the flash to get a good picture. However, here is a link to the Gettysburg Visitor Centre where you can see the painting in all its bloody detail. Moving on, back out into the ever-increasing heat of the day, it was now touching 40 degrees C, (103 F) as per the thermometre on the wall outside the visitor centre and I had to get over to the other side of the battlefield to meet Gen. James Longstreet and Ranger Karlton Smith who was going to describe the trials the Confederate Lt. General had on that very day back in July ‘63. I arrived at Gen. Longstreet’s statue to find that a large crowd had gathered. We all took cover out of the heat under the trees that surround the equestrian monument of the General and waited for Ranger Karlton to arrive. As I waited, more and more people arrived, all it seemed very eager to learn about one of the Confederacy’s most loved and sometimes hated characters. It seems everybody here was a fan of this rebel leader; like rock stars, each of the generals, from Lee, Longstreet and Hill to Meade, Reynolds and Buford all have their own fan clubs with a loyal and dedicated bunch of followers. Ranger Karlton delivers a weather forecast. ‘Crikey! That’s a bit OTT,’ I thought, as I quickly outlined in my mind the quickest route to my car. The lecture got underway. All was going well and Ranger Karlton was indeed a mine of information concerning the good General. But the atmosphere seemed to have changed in the last few minutes. The welcoming breeze that was rustling its way through the trees was gone. There was no more bird song. In fact, the only sound now was Ranger Karlton as he described the moments before the battle for Little Round Top ignited. ‘First Corp was in place finally, and the Texas Division under General Hood stepped out and began to climb the hill. Suddenly, the cannonade began…,’ Ranger Karlton said with a sweep of his hand towards the horizon. There was a blinding flash and a clap of thunder, the likes of which I have never heard before. I swear I felt the ground shake. ‘Ok, ladies and gentlemen, that’s it, head for your cars now, please,’ Ranger Karlton said. The lecture was over. One joker called out ‘But, who won?’ I laughed along but when another flash of lightning struck and thunder echoed across the battlefield, I decided it was indeed time to go. It was apt, really, that my second day on the battlefield ended like this, with flashes of light and a thundering roar. Tomorrow I would be back again for tales of more slaughter and heroism and to stand at the site where General Lee and his army rolled the deadly dice one last time. We need to rethink the whole St. Patrick’s Day scene. 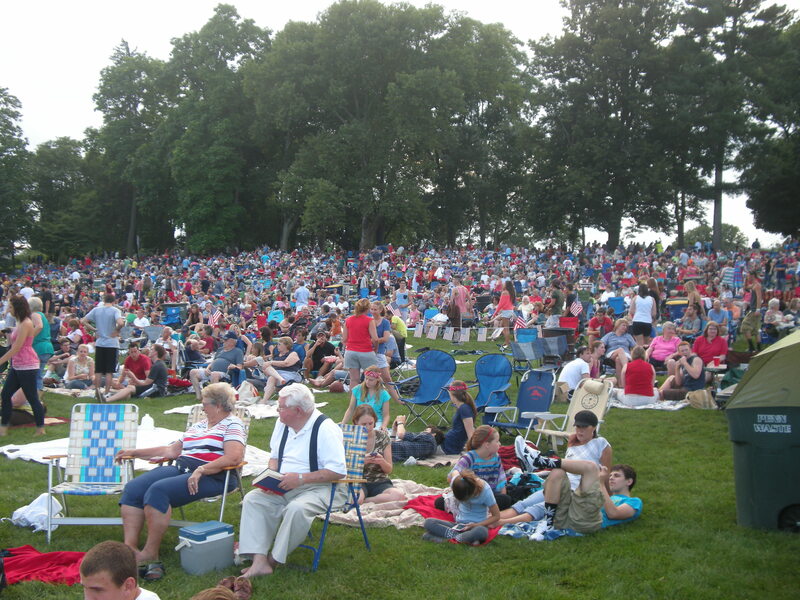 Our national day couldn’t hold a candle to the celebrations I was witness to here in Lancaster, PA, as Americans from sea to shining sea celebrated their Independence Day. That’s right, it’s the 4th of July and boy do they know how to ‘USA it up’ big time. 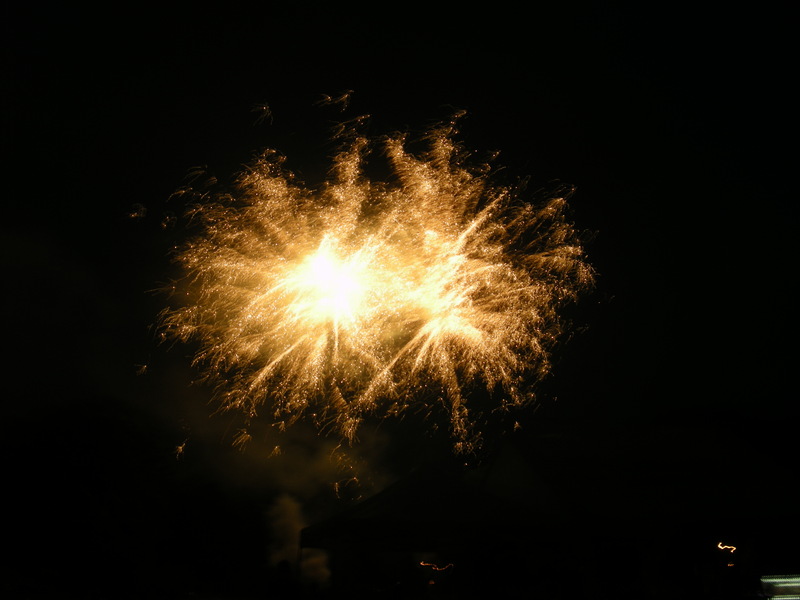 Now, I’ve seen fireworks before. Five minutes of starbursts over Bantry from the Maritime Hotel at New Years had us all enthralled. But you ain’t never seen fireworks until you’ve witnessed the 45-minutes of pyrotechnic madness that is the display put on by the good people of Lancaster County, Pennsylvania. 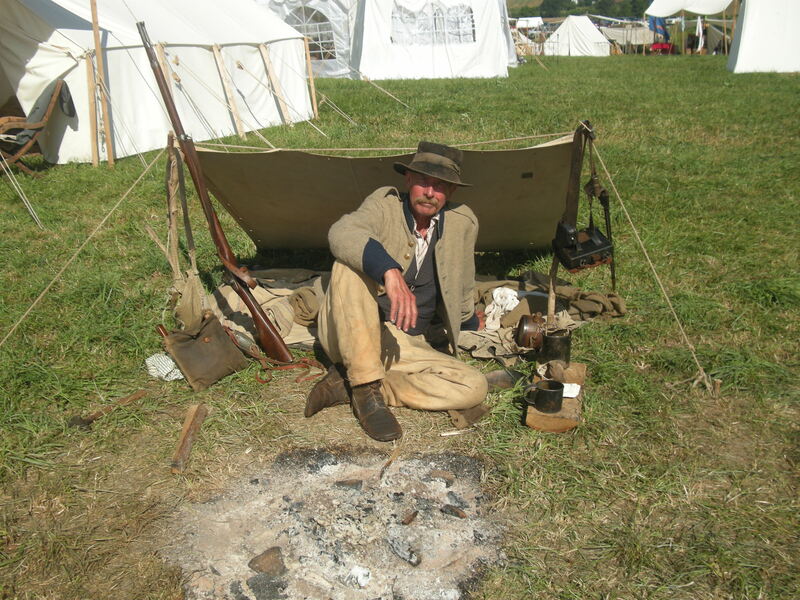 I arrived back from Gettysburg after spending four days neck-deep in all things Civil War; I was tired, hot and cranky. Then Marian, my sister-in-law, made me an offer I couldn’t refuse. ‘The ex-mayor of Lancaster has a few Civil War cannons. He said you can go and take a look at them if you want’, Marian offered. I didn’t have to be asked twice. Charley, that’s the ex-mayor, was getting some of his guns ready for the 4th of July celebration at the local public park and said we could go along and see the guns being loaded on to the trucks that were to transport them to the park. The guns were going to take the central part in the 1812 Overture just before the fireworks got underway. We left the house and headed for downtown Lancaster. There, just off one of the many pretty streets, we came across ‘Jim’ working hard to secure a big 12-pound Napoleon smoothbore cannon on to the back of a low-loader. 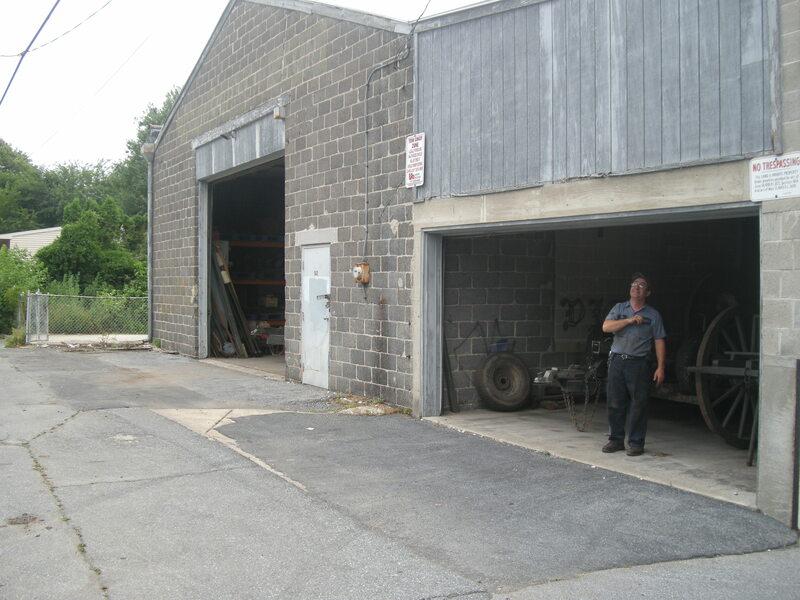 Jim was outside a double-doored garage and he invited us to go in and take a look around. There’s Jim outside his garage housing a FEW cannon. 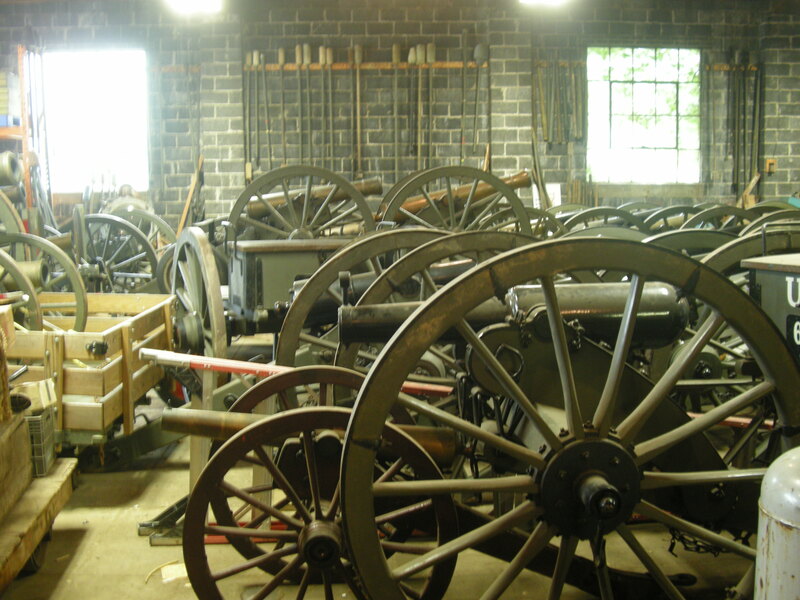 Inside the garage there was arranged in neat rows enough cannon, cannon balls and shells to invade a small country. I stopped counting at 22. 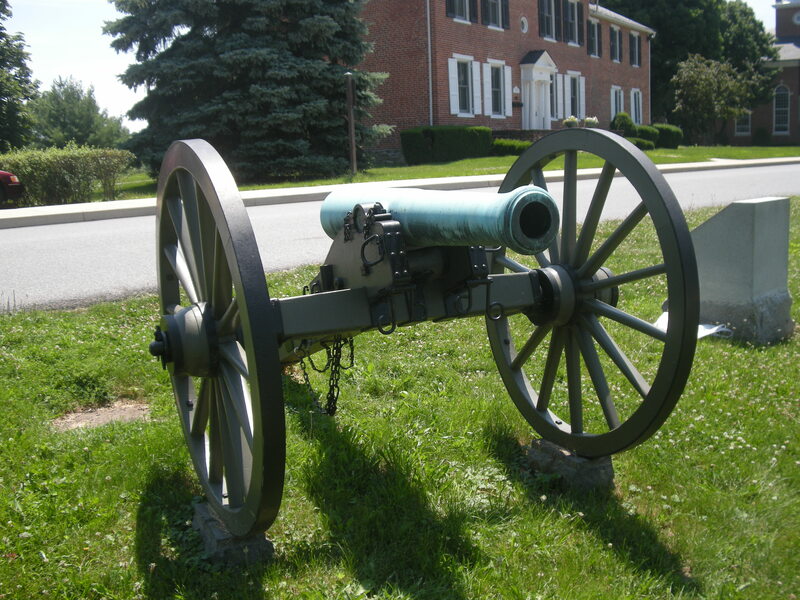 These were not like the cannon dotted around the battlefield at Gettysburg; these guns were all in working order and 16 of them plus a mortar were on their way to the local park. 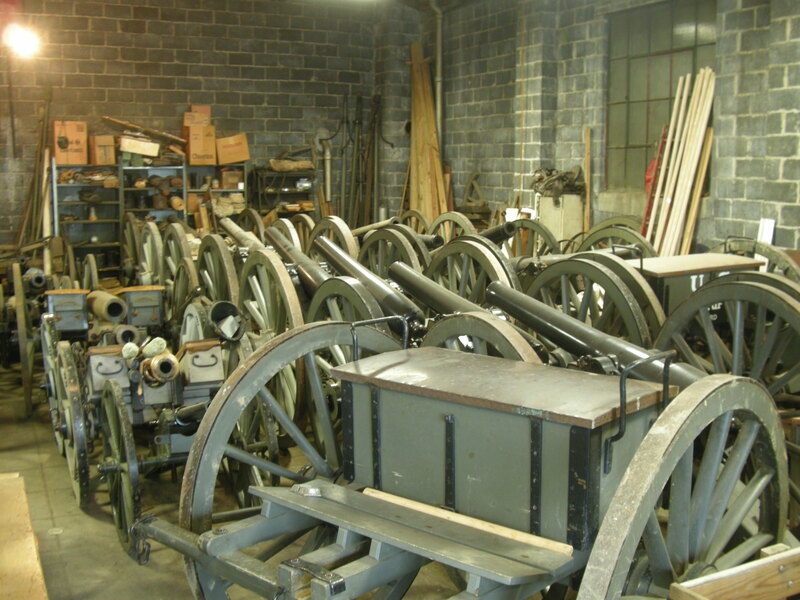 These FEW cannon were in fact part of the largest privately owned Civil War cannon collection in the USA. Every cannon needs a ball to fire. The guns are fired regularly and Charley has the facilities to cast his own ammunition. I’m trying to imagine something like this at home. Now that I think of it, maybe cannon collecting is a hobby one or two of our county councillors should think about? And to really get a bang for your buck, you need some shells. Anyway, as we waited for the cannonade and fireworks to begin, we were entertained by the US Army Band ‘Pershing’s Own’. Although, as my sister-in-law Marian said, it was strange to see people in uniform singing a medley of Beatles songs. Then, with the 1812 Overture playing loud over the speakers, the cannon fired, the ground shook and the huge crowd went wild. As the applause for the Army Band and Charley’s cannon died down, the fireworks began. Night became day as over and over again rockets climbed high above our heads to explode in multi-coloured balls of light and smoke. The noise was incredible, the light was incredible, the whole 45 minutes of explosive action left me wondering how much more of this I could take. This is the way to celebrate the independence of a nation, with gun powder, cannon and a few patriotic songs for good measure. So, here’s the plan. We move St. Patrick’s Day to the end of July or the first fine day in August. We celebrate our national day with parties and music in all the public parks across the country, no drink is allowed in the parks, and we encourage our county councillors to bring along their cannon. I think this could take off. I really do. 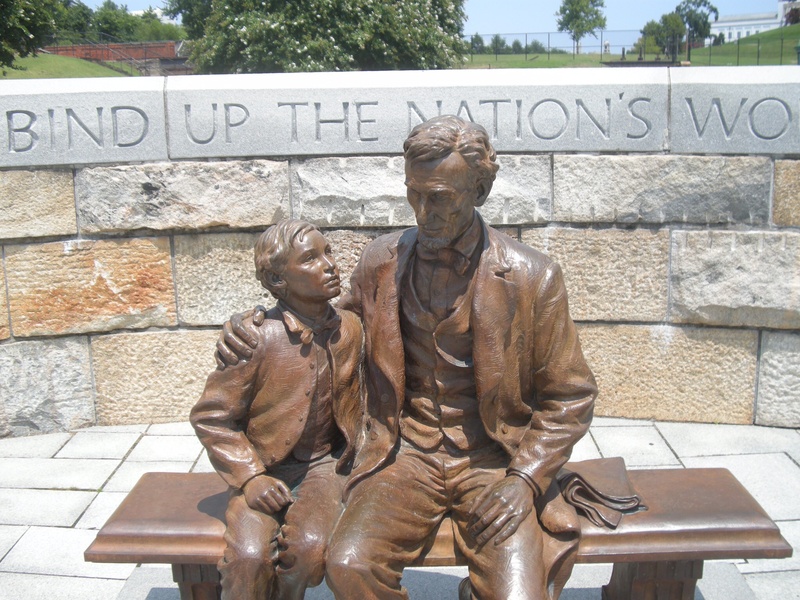 When I was planning this trip, Gettysburg was the point at which I started. 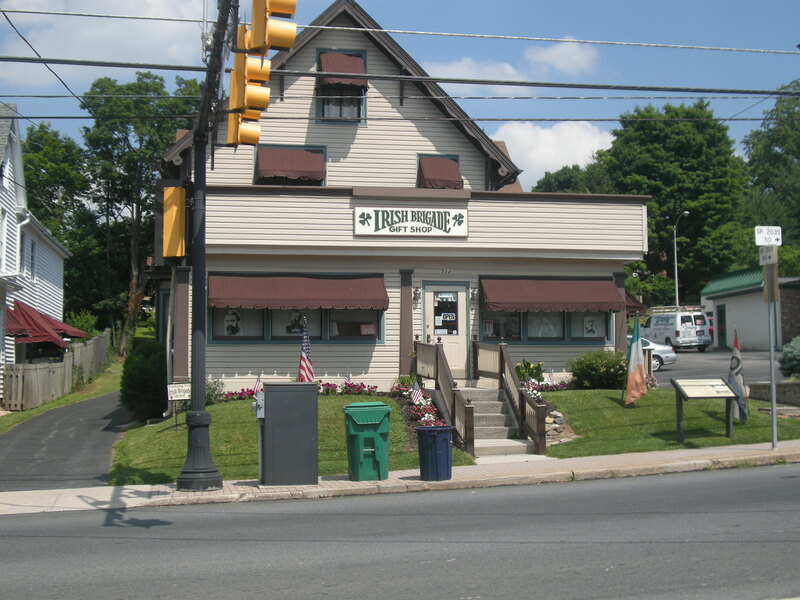 There’s something very special about this small Pennsylvanian town. Aside from the tens of thousands that died here, the town seems to have been created with its history in mind. You couldn’t ask for a better place to fight a 19th-century battle. When General Robert E. Lee decided to take the fight into the heart of the Union, all the roads, literally, led to Gettysburg. While the Confederate and the Federal generals never set out to fight at the Pennsylvanian crossroads town, history and fate seemed to draw both armies to this small patch of rolling land just north of the Mason-Dixon Line. 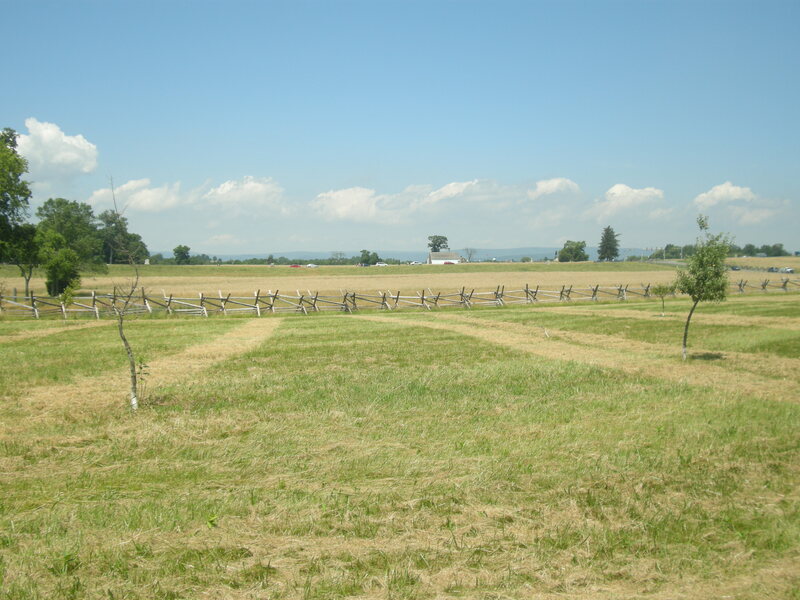 This is the field where the first shots were exchanged on 1 July, 1863. If you notice the white house and the cars in the distance, that’s McPherson’s Ridge and it’s from there that the Rebels advanced towards the Seminary, which is behind me as I took the photo. Now, I’m not going to go all history geek on you but to tell you about my experiences at Gettysburg we have to set the scene. First some stats; this was, in every sense, an epic battle. 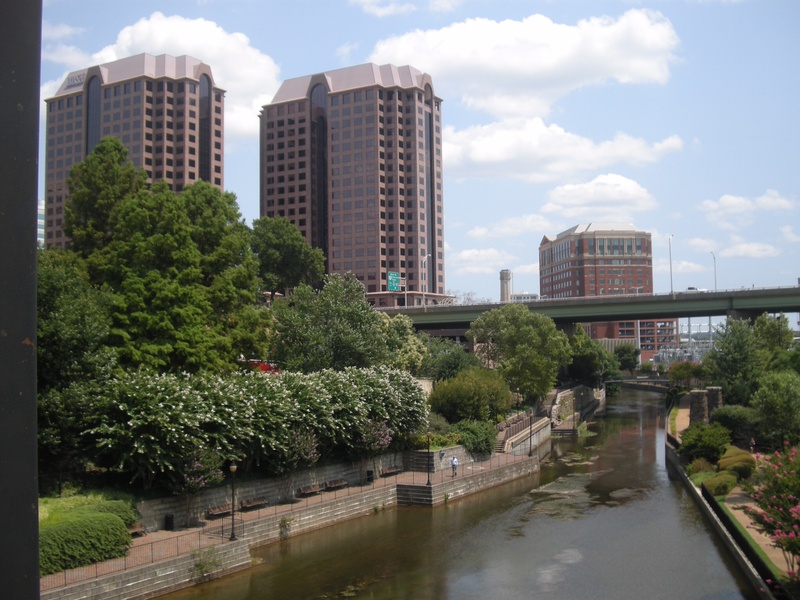 General Lee’s Confederate Army of Northern Virginia arrived with nearly 72,000 soldiers. The seminary from where Union Gen. Buford watched the Confederate Army advancing. Three days later, when his battered army limped back into Virginia, over 23,500 men were dead, wounded or missing. With the Union army under the command of newly promoted General George Meade, who took the field with almost 94,000 men of the Army of the Potomac, there were over 165,000 soldiers facing off on a battlefield where you could see from one end to the other. Union losses amounted to more than 23,000 dead, wounded or missing. That’s a total of some 46,500 casualties. 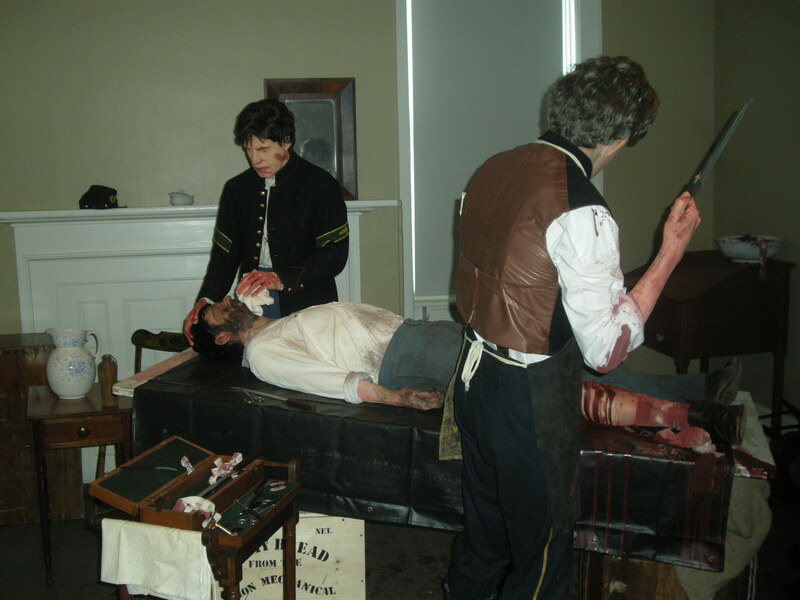 It all got a bit bloody at Gettysburg, and, no, that’s not a young Mick Jagger administering the chloroform. Let’s put this in perspective. The current strength of the Irish Defense Forces stands at 16,200. This includes the army, navy, air corps, plus the reserve army and navy personnel. Can you see in your mind’s eye the carnage the people of the town of Gettysburg witnessed when they returned to their homes? It took many years for the town to be cleansed of all the death and destruction. Imagine this if you can. The number of dead soldiers lying where they fell was truly horrific so they were buried as quickly as possible. Every time it rained, these mass graves would be exposed to the elements again (in their haste to dispose of the bodies, the grave diggers didn’t dig too deeply). It was long after the battle by the time all the bodies were exhumed and properly buried in cemeteries. There were 6,000 horses killed at Gettysburg. These were gathered up and burned. Can you imagine the smell? So, my story begins at the Travelodge Motel where I was staying for three days. I parked the car and decided that I would walk from the motel to McPherson’s Ridge, where the first shots were fired on 1 July, 1863. The distance is about two miles and the terrain is very flat, except for the slight rise as you get to Seminary Ridge. 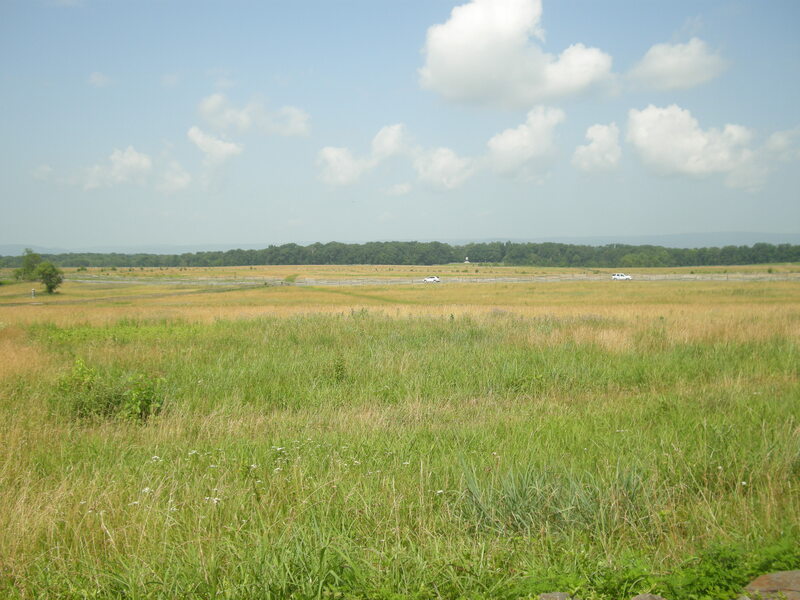 That’s the topography of Gettysburg, and the battlefield, if you look at it side-on, is like a line of waves. These dips are bordered by two ridges: Seminary Ridge held by the Confederates and Cemetery Ridge held by the Federal forces. The temperature was in fact 31C, or 88F if you prefer. This was almost as hot as 1 July, 1863. Almost, but not quite; when the first shots were fired, the temperature was a toasty 35C (95F). I walked on. At about the half-mile point, I was covered in sweat and fading fast. My water was gone and I started to leap-frog from one shady spot to the next. I found a shop and bought two bottles of water, took a deep breath and headed out again. Just in case I wanted a fix of leprechauns, shamrock or Aran sweaters. All of which are for sale inside. After what seemed like a marathon (I have never run a marathon so I’m only guessing here), I arrived at McPherson’s Ridge just in time to see a group of Confederate re-enactors marching by in full uniforms, flags flying; with bayonets shining in the sunlight, they looked every part the invading army. I had to rest. I could hear my heart in my ears and I must have looked like someone who had just stepped out of the shower. I saw a park bench and sat down. It was like a hot plate. I could have cooked on it. I sat there. I wanted to get up, but I needed to sit down. I must have looked like a piece of bacon on a frying pan jumping about in the hot oil. Never touch a metal cannon when it’s this hot! Then one of the Confederates asked me if I was ok.
‘I’m grand,’ I said, in my best Irish brogue. ‘It’s just this heat, how do you function in a climate like this with that, what is it, woolen uniform and all that equipment?’ I asked. My rebel friend just smiled and said, ‘Yeah, it’s all wool, including the trousers. And it gets as hot as hell, but you get used to it. You take care now,’ he said as he returned to the ranks and his waiting comrades. This got me thinking. I followed the route taken by the 1st Corp of the Union army as they raced to stop the rebels at Seminary Ridge. That is, I did two miles of the route; the Union soldiers marched, not walked, 20 miles in full uniforms, carrying 15kg (33lb) packs, rifles and ammunition. And then, after that forced march in this heat, they fought and died for over twelve hours. I was wearing a t-shirt and shorts and carrying two bottles of water, and all I wanted to do was curl up in a shady place and sleep. In fairness, they were litre bottles of water and very awkward to carry. Of course, there is another factor to consider; a fact that I have my re-enactor friends to thank for. 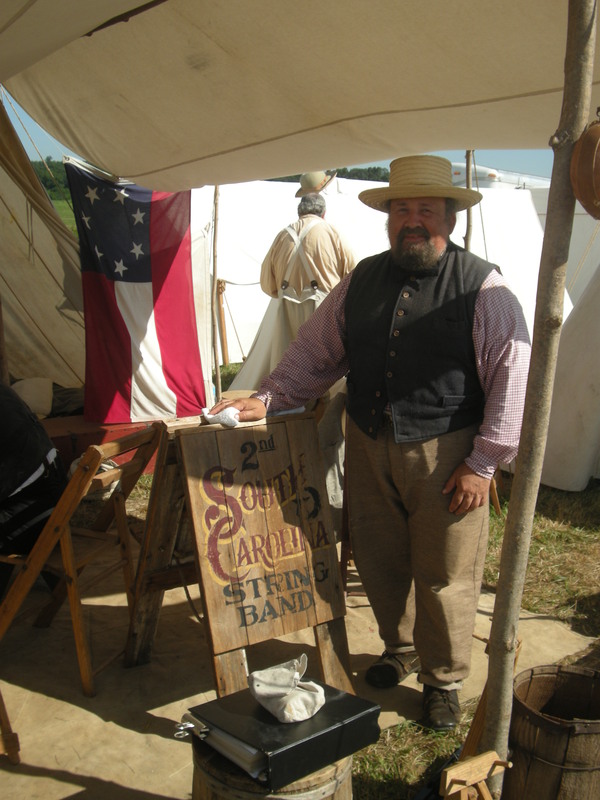 Later that day, as I was discussing how amazed I was at the abilities of the soldiers on both sides to march and fight in this heat, one confederate from Georgia told me that with the woolen uniform you sweat like ‘ a stoker on the Titanic’. Still, that wasn’t the worst of it. What happens to wool when it gets wet? As my first day drew to a close, I knew I had to walk back to the motel. At least the sun was beginning to lose some of its heat now and the shadows were much longer giving me more shade on the way back. 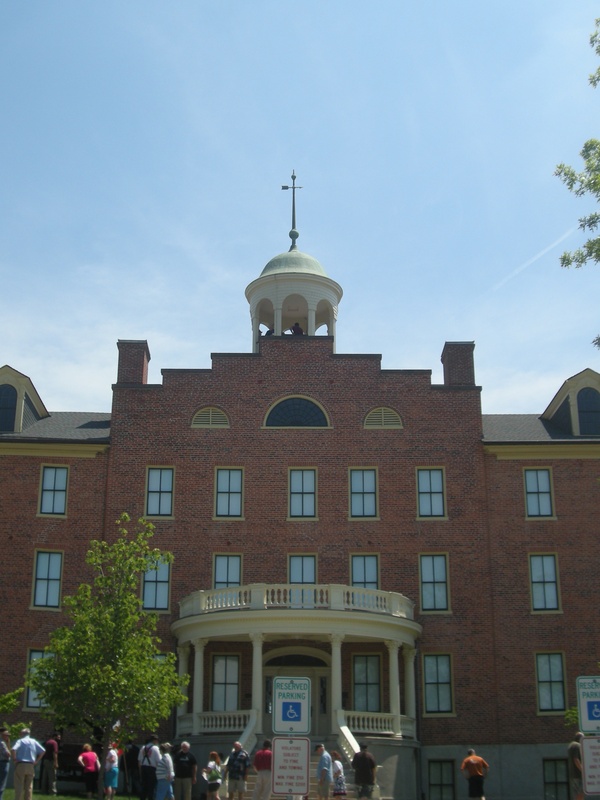 But before I left Seminary Ridge, I walked out into the middle of the field between the two lines. Standing there, in this spot where so many men fought and slaughtered each other, it suddenly became very quiet. I could see the people and traffic on either ridge but here in the middle, in one of the dips, it felt peaceful and safe. I can’t explain it. It was as if I had entered a sacred place. Like a church or a grave yard. And I suppose, in a way, this place could be regarded as both. On Seminary Ridge, a Confederate cavalryman holds the Union flag. Reconciliation at last?